Many have tried and failed so far, until now: An external graphics solution that is supposed to help mobile notebooks to improve their performance at will. The main problem thus far: A relevant high performance external interface for the exchange of data to and from the notebook was missing, which is able to also serve the integrated display at peak performance. This problem has now apparently been solved by Sony thanks to the new Intel Light Peak technology - an external monitor makes a lot more sense. Does that mean everything is perfect? Not quite. More on this in the following review. When it comes to Sony's top of the range models, these have for the past several years been of the favorite 'small black' variety. This options is of course not completely arbitrary, since this is also supposed to represent the material value of the notebook. The online configuration tool on Sony's website in addition also provides three further designs: Blue, gold, and premium carbon. Carbon is the material used by Sony to achieve the best possible performance to weight ratio. 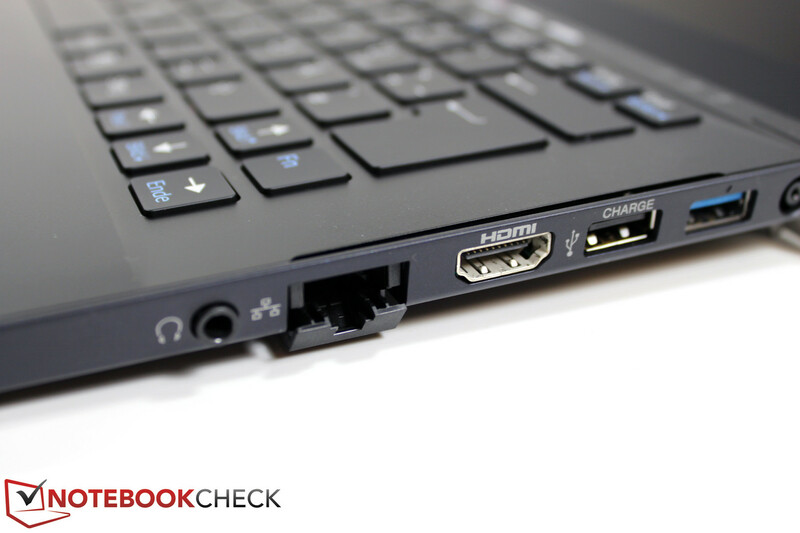 The Japanese manufacturer declares an official thickness of 1.7 centimeters, and a total weight of only 1.2 kilograms, which is below Netbook values, in its documentation. We measured to make sure: 1.15 kilograms, and 17 millimeters not including the two millimeter rubber feet, which is therefore correct. Optically the case can definitely make a good impression: Elegant, simple, understatement par excellence would be fitting. When it comes to handling the device it quickly becomes obvious though that we are dealing with a plastic case in the sub 1000 euros class. The satin surfaces are good at concealing finger prints and dust particles, and definitely feel qualitative. 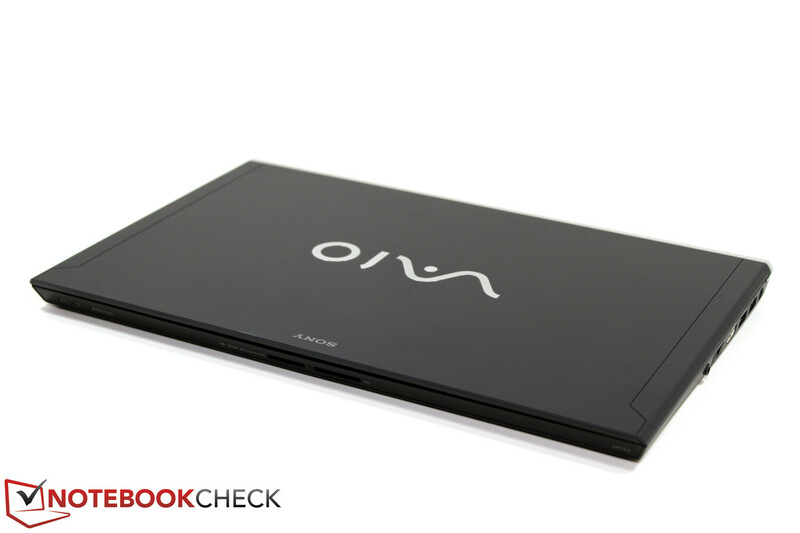 Without knowing it would be possible to think of 08/15 plastic, in detail the Vaio Z21 can still sway all doubts though. Paint problems, uneven gaps, or even a wobbly battery? - Our reviewed device didn't show any of these weaknesses. Apropos battery: Sony has been known for not always taking the precision of the battery size too seriously in the past. This shortcoming was however obviously avoided intentionally with these high-end models. 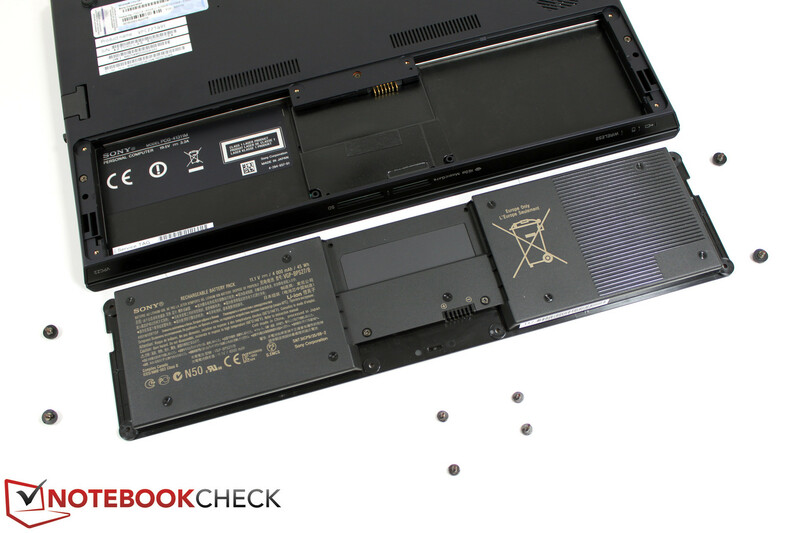 Compared to its counterparts in the 13 inch segment, such as the MacBook Air or the Samsungs 900X3A, with which the battery can either not be removed or only after taking apart the case (warranty? ), Sony has attached the battery to the bottom of the base unit in the front region with the help of 8 (!) screws. Changing this is therefore possible, but only with a lot of effort. The remaining components cannot be accessed however, with the exception of taking apart the whole case. What for though, the RAM is soldered in place - which prevents any further future upgrades. And also the Solid State Drive has a special format which prevents an easy exchange. Those that want to take a look at the inside of the Vaio VPC-Z21 anyway can do that by watching this video. Before we continue, just another quick note regarding the case: The attractive optical appearance and high quality feel aren't quite matched by the stability of the case. The base unit can easily be dented somewhat by a little pressure in the area around the palm resting area, as well as the keyboard (wireless switch). This becomes more apparent when it comes to the display. The lid of the only 5 millimeter thin component may not let any pressure through to the sensitive display panel, but it can be warped easily. Merely two fingers are enough to create a lot of bending. Let's begin with the interfaces provided directly on the notebook. The left side is primarily occupied by the generously sized cooling vent. 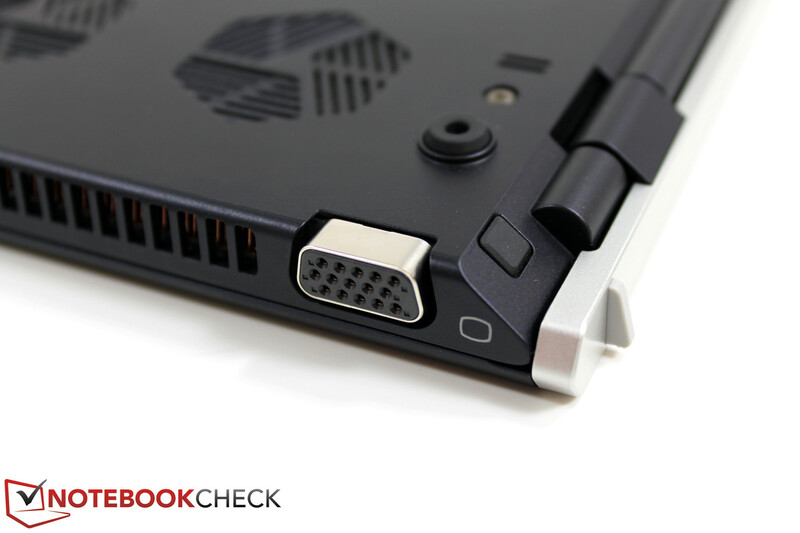 The VGA port in the rear region attests how close the case is to its limits when it comes to thickness. The front contains Sony's obligatory two card readers, whereby one of these reads the proprietary memory cards (MagicGate), and the other can accept the classic SD cards (SDHC, SDXC, CPRM). 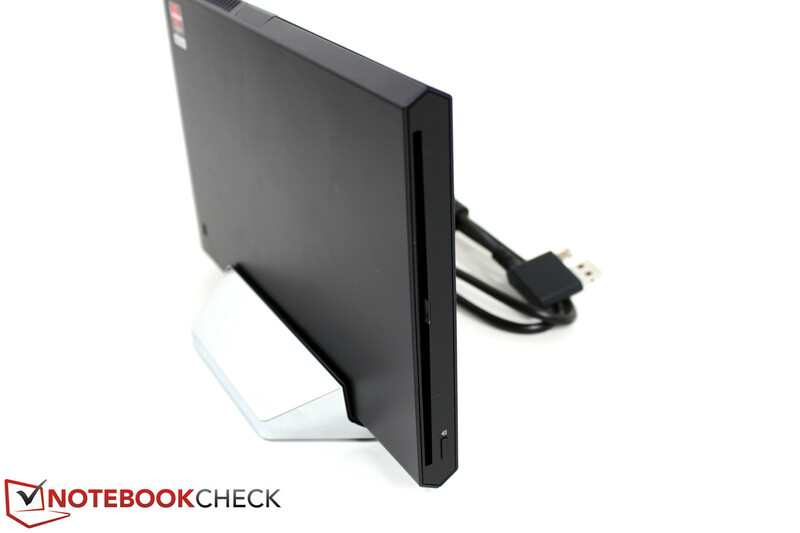 The right side contains a LAN port which is made possible in the thin case by a folding mechanism. 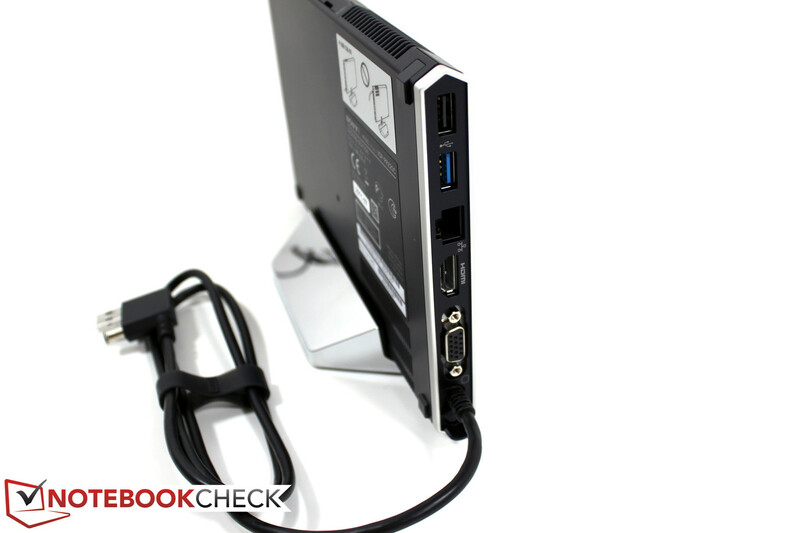 Following on from this there is HDMI, USB 2.0, and a USB 3.0 docking combination. 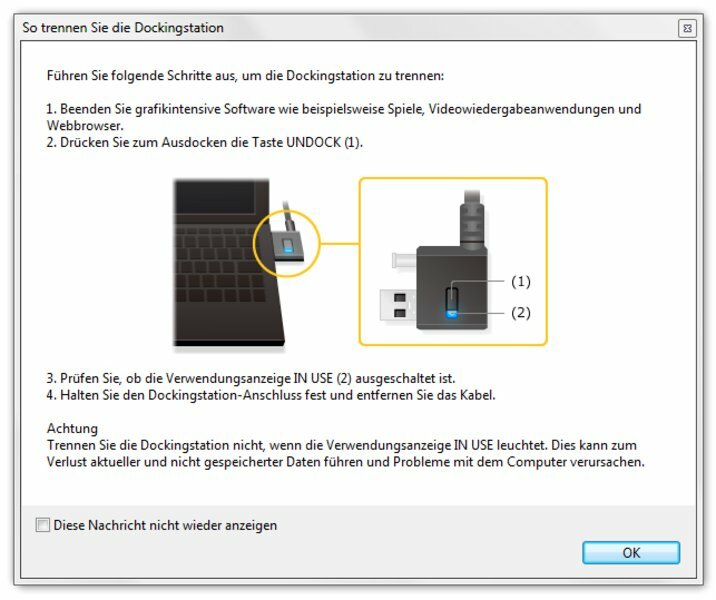 At first glance the interface for the Power Dock is not discernible from that of a conventional USB port, this wouldn't allow the concept to work though. 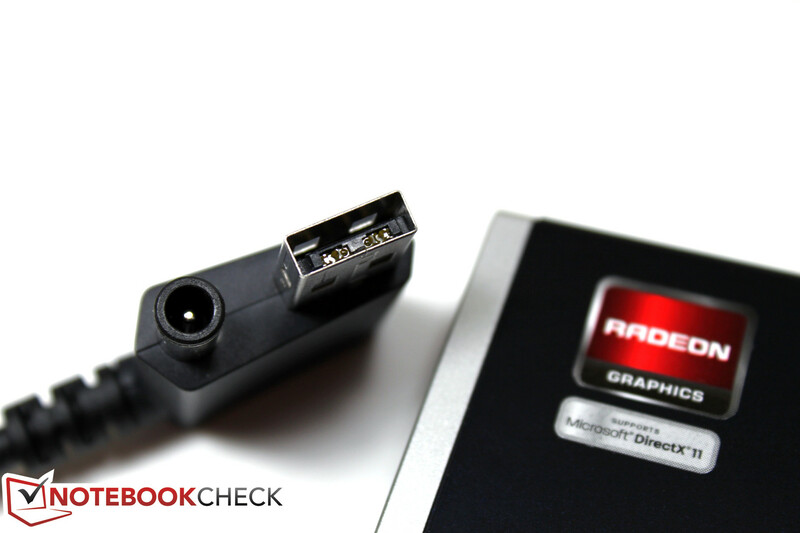 When taking a closer look, two small optical elements as well as the appropriate counterparts can be seen in the USB 3.0 socket. 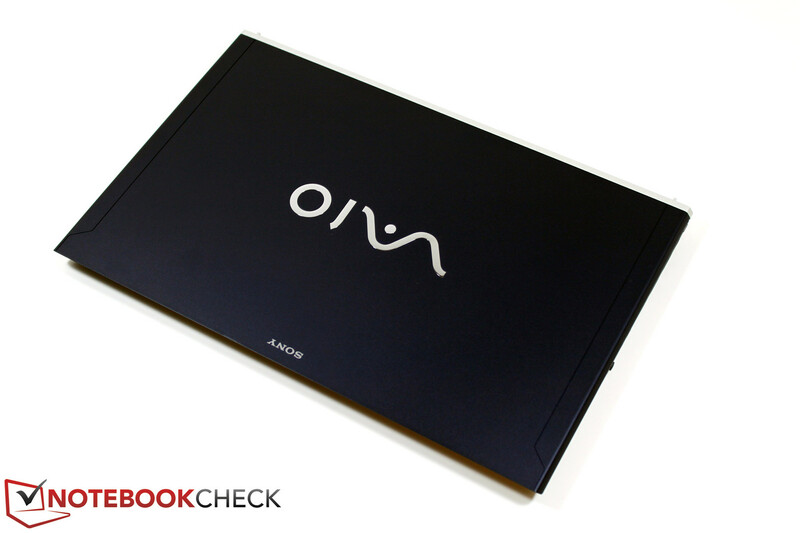 Thus we are dealing with one of the first series production notebooks with an incorporated optical interface technology, which is based on Intel's Thunderbolt (previously Light Peak) technology, even if adapted by Sony for a proprietary solution. The current Apple notebooks may also use this technology, but this still uses a copper circuit data transfer route which can be implemented much more cheaply. At present Intel prefers the Mini DisplayPort as standard, and thus future accessories will likely not be compatible for users of the Sony Z21 with the Thunderbolt interface. An important point in the press release for the VPC-Z21 is the possible multi-monitor operation, with up to 4 displays including the notebook display itself. The first thing we did was to test the VGA port directly on the notebook with a Dell 2408Wfp monitor using the maximum resolution (1920x1200). The result doesn't really make a convincing impression. The displayed images may still be sufficient for working, but when looking closely the writing in particular is slightly unfocused. Further to this we also noticed a slight flickering on the monitor. We compared the HDMI port with the same external display: The picture is sharp as expected, and the flickering is also gone. We repeated the test with the two ports on the Power Dock with the same result: The presented picture via VGA is just as unfocused, while HDMI is sharp and crisp as expected. Altogether the HDMI ports are therefore definitely preferable. With a total of three monitors in the maximum-configuration, at least one VGA port has to be used though. This situation is however more likely to be an exception rather than the usual scenario. We also tested the possible data transfer rates of the provided USB ports. The 3.0 docking port can easily serve out external HDD with Ineo NA201U with Samsung HM500JI, with transfer rates of between 44 and 89 MB/s. Using the USB 2.0 port we measured significantly lower values at between 27 and 30 MB/s, which are in the usual range for these specifications however. 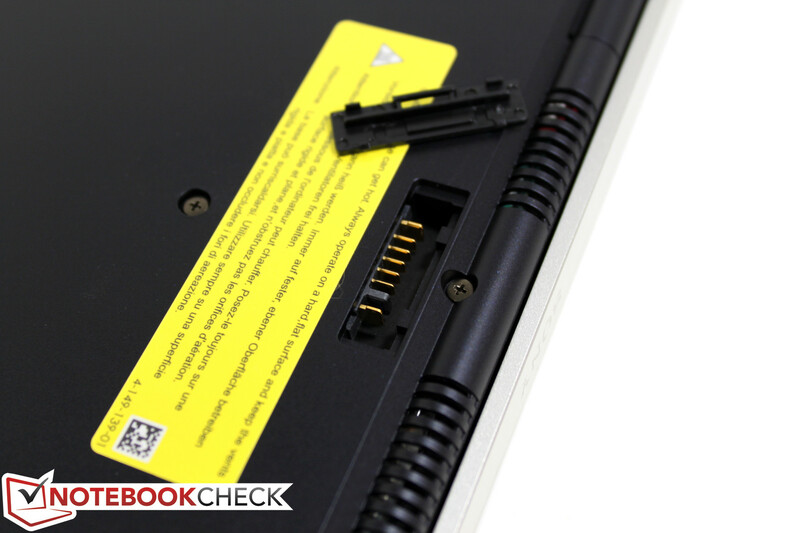 Despite the especially slim case Sony has included a classic RJ45 LAN port, which had to be integrated as part of a folding mechanism in order for it to fit into the case. Behind the port is a Gigabit controller from Realtek. The wireless communications are provided by a module from Intel (Centrino Advance-N 6230). Bluetooth 2.1+EDR is just as much standard as the Vaio Everywair 3GWWAN technology, or in other words a HSUPA module (Huawei Gobi 3000) with up to 14.4/5.76 Mbit/s data transfer rates (according to Sony). The search for the SIM card slot ended taking quite some time, this would have been quicker with the digital user guide - reading aids learning! - which can be found via the Vaio Tools in the dock at the top of the desktop. Nevertheless, the SIM card slot wasn't accessible, and the exchange of the pre-installed Vodafone card was therefore not possible, since the eject mechanism for the SIM card slot was obviously on strike. In principle SIM cards from any provider should be usable with the device though, at least Sony confirmed this for us. The software as well as the hardware is used by Sony to provide a series of security features. Included with these are for example the fingerprint reader, which can be found between the buttons of the touchpad. The integrated TPM module, as well as the Kensington Lock on the left side of the case, also provide the user with protection against (data) theft. 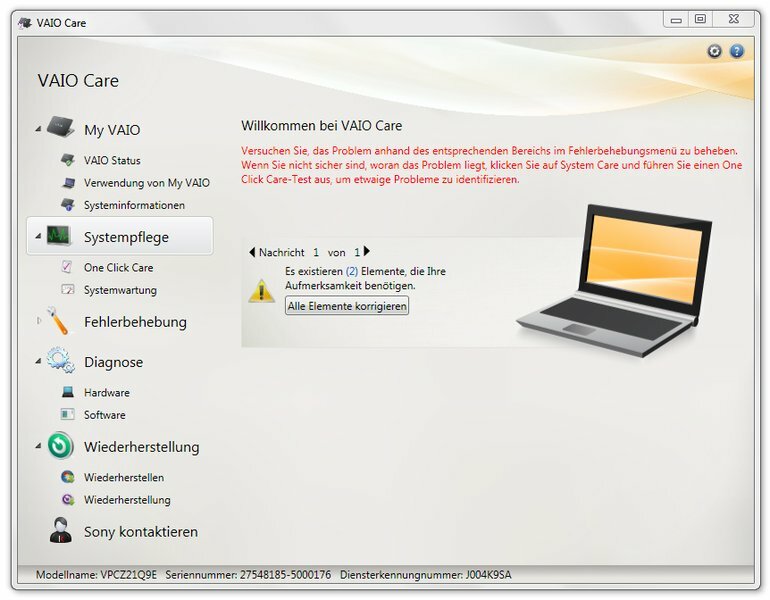 Similarly to the well known Thinkvantage Tools provided by the Lenovo ThinkPads, an additional button above the keyboard with the tile 'Assist' provides access to the Vaio Care Center. This is a software tool which bundles different options (updates, diagnosis, restore, etc. ), and makes these easily accessible. The box containing our reviewed Vaio VPC-Z21Q9E also had an AC adapter, diverse printed documents, a cleaning cloth, and the aforementioned Power Media Dock with the product code VGP-PRZ20C, which is equipped with its own slightly bigger AC adapter. The Media Dock is available in three different versions, whereby the only difference is the kind of optical drive they contain. Available are the usual DVD combo drive, a Blu-ray player, or a Blu-ray burner (additional cost 50 or 100 euros on top of the Power Dock basic price of 369 euros). Further to this there are also additional gadgets available for an additional sum, such as an extension battery (battery slice) VGP-BPSC27 for 150 euros RRP, a replacement battery (BPS27) for 120 euros RRP, as well as diverse leather carrier bags for the notebook. The basic warranty for the Sony Z21 is a 24 month Bring-In warranty, more specifically it has to be sent back by the customer. Sony also offers an additional optional extension to 3 years (149.90 Euros), or an extension to 4 years with the title 'Complete Coverage' (349.90 Euros). The latter of these also includes a special telephone support service, a product exchange service for the first 3 months, and a complete guarantee including accident protection. Particularly in the case of the accident protection users should know exactly what accidents are included in the cover, and which ones aren't. A pity: On-Location service is not provided. In this case users will have to be content with the 5 day collection and repair period. The chiclet design keyboard has absolutely flat keys with a size of 15x14 millimeters with a relatively generous gap between them of around 4 millimeters. The integrated keyboard backlight was almost missed by us, since this is deactivated in normal ambient lighting conditions. Only when the ambient light levels are dark does the backlight automatically provide for legible keyboard markings in these conditions. 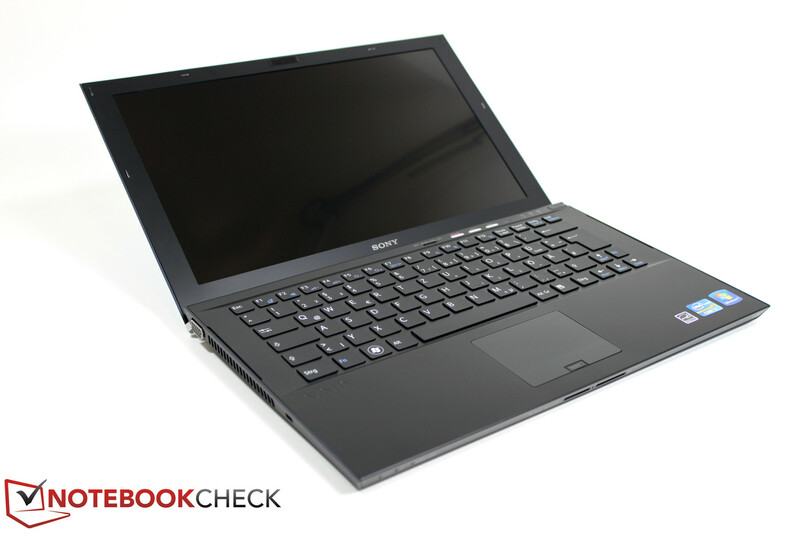 We were unable to find an option for manually switching the backlight on or off in the Vaio Control Center. The typing feeling of the keys is characterized by an especially short key travel, combined with a difficult to feel pressure point, and a hard end stop. Liking or disliking is a matter of personal taste in this case. Fast typing is definitely easily possible with the provided keyboard, although the flat keys also make orientating the fingers somewhat more difficult. Familiarization with the keyboard will undoubtedly play a part in this case. The control of the audio volume has to be accessed via the relevant Fn key and F key combination. 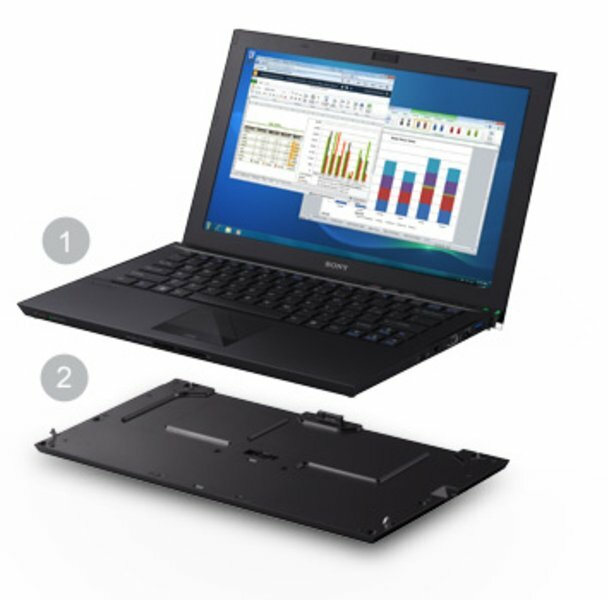 The hardware option for deactivation and activation of the wireless modules is provided by a moving switch above the keyboard, where there are also three more additional keys (Assist-Vaio Care, Browser - standard browser, and Vaio - Vaio Control Center). 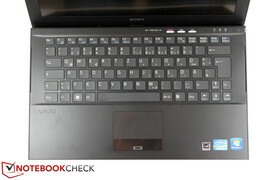 The touchpad without buttons (Synaptics ClickPad V8.0) is supposed to 'make working even more comfortable', at least as far as Sony is purporting. We aren't completely in agreement, and this has several concrete reasons. For instance, the sensitive surface of the touchpad only has dimensions of 7.3x4.1 centimeters, which is comparatively small. Especially the multi-touch gestures suffer as a result. 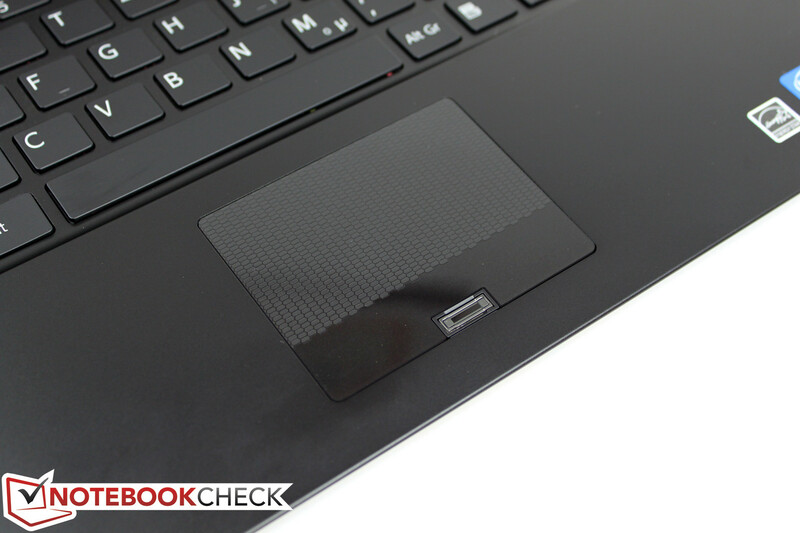 The surface of the more or less completely flat touchpad is covered with a web structure, in order to provide for good gliding properties even when fingers are not completely dry. In practice this only worked to a marginal extent though. 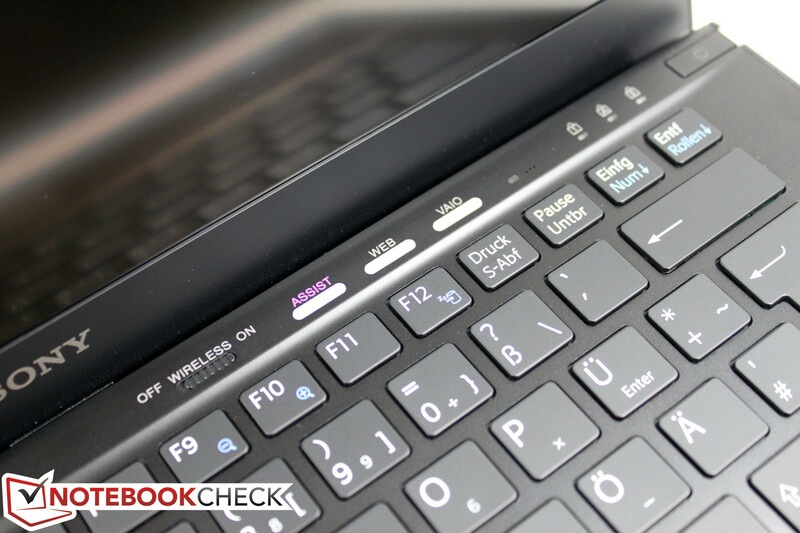 The touchpad doesn't provide separate buttons, but instead has a clickbar across the bottom. The haptic feedback when clicking this is also unusual though, and also characterized by a minimally short travel. 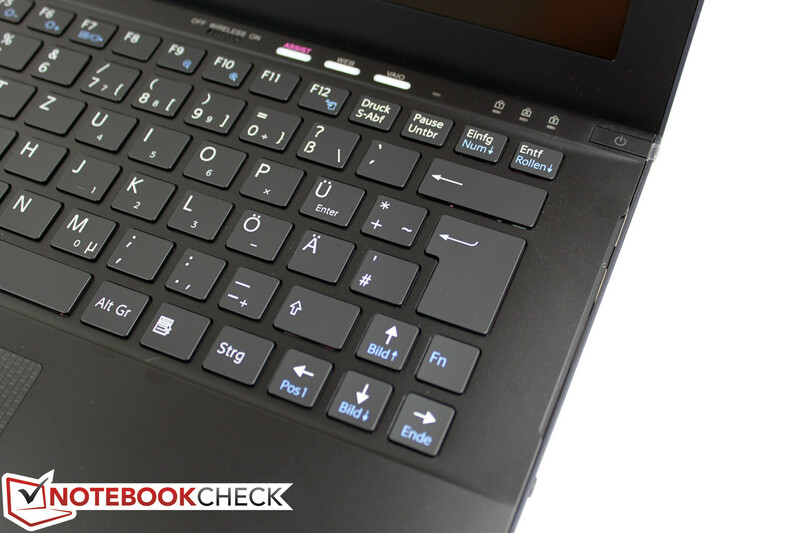 Things become particularly unpleasant when the touchpad is not clicked exactly inside the clickbar area, and the pressure required is much higher, or the click is not acknowledged. 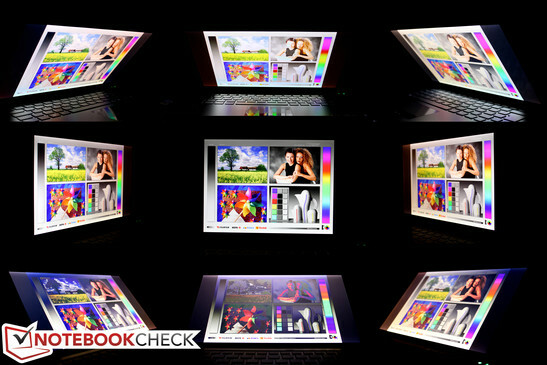 Things are getting interesting: What makes Sony one of the main contenders in the battle for an all round successful notebook? The key data sounds promising: 13.1 inch, anti-reflective surface, 1600x900 pixels, in the basic version. 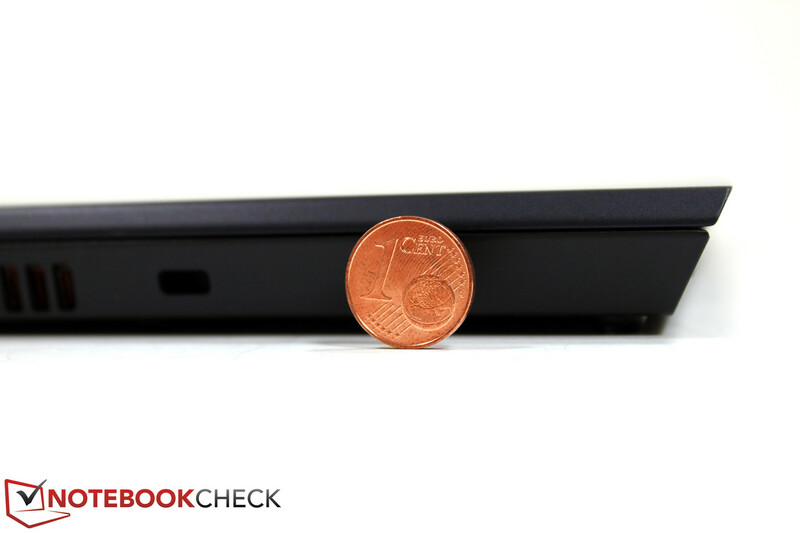 Our measurements confirm the expected good results: Maximum 307 candela per square meter, 285 cd/m² on average, illumination about 82 percent - perfect for a mobile notebook, such as the Sony Vaio Z21 aspires to be. For professional users with elevated demands regarding resolution (multitasking, tools, etc. ), and other Full HD enthusiasts, Sony offers an upgrade to a 1080p display in the online configuration. The price: A mere 40 euros additionally. In light of the basic price of about 2000 euros, this is likely to be an inconsequential sum. How good the brightness and color space of the display are remains uncertain so far though. The Full HD display was able to make a good impression in the predecessor model though. To confirm whether or not the display really is particularly good (SNY06FA), we have to complete two other obligatory measurements: Contrast and color space. We measured the black level in the central area of the display with the maximum brightness: 0.26 cd/m² - exceptional. With this the HD+ display can score points with an exceptionally good maximum contrast ratio of 1146:1. 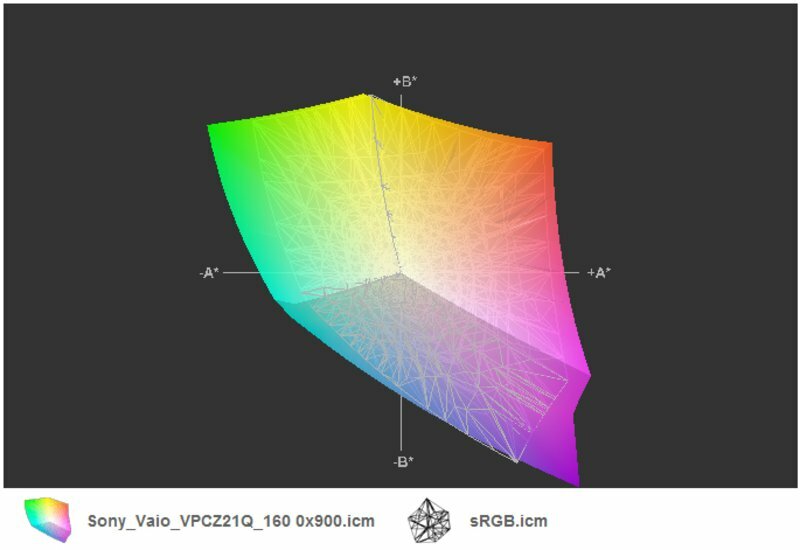 No less impressive is the representable color space. sRGB is more than covered, only when filling the large AdobeRGB color space do shortcomings begin to emerge. The color space is not longer completely covered, and also when compared to the elite display Sony Vaio VPC-Z13 with a Full HD display, the VPC-Z21 with HD+ falls behind. A comparison to the alternative Full HD display panel would also be interesting in this case. 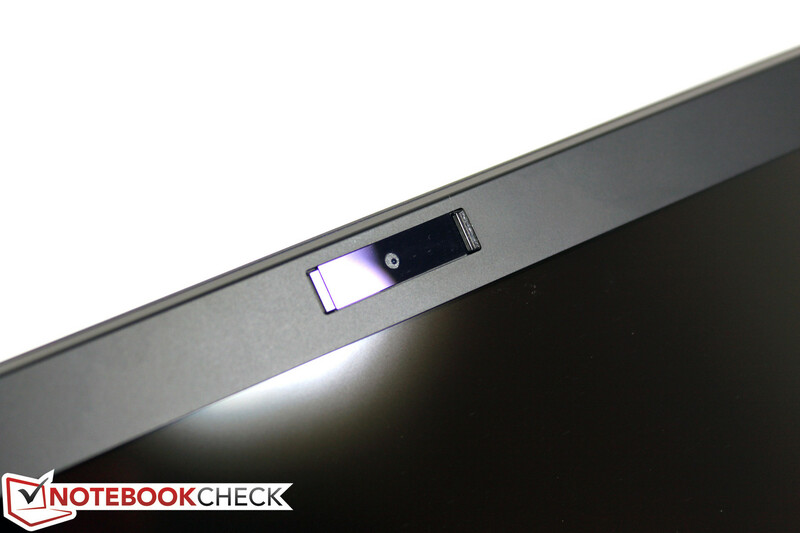 The surface of the display can be described as a combination out of a glare panel with a matte display. Reflections can appear in some lighting and viewing angle scenarios, but the contours are badly defined, which makes them significantly less distracting. Combined with the high brightness level of the display outdoor use of the Sony VPC-Z21 is possible without problems in almost all circumstances. Even direct sunlight on the display doesn't trump the images, and it is still possible to navigate the display accurately. The thoroughly convincing points are unfortunately followed by a less pleasant aspect: The viewing angle stability. Typically the display is blessed with relatively tolerable viewing angles in the horizontal plane, but in the vertical plane the images can quickly become less than ideal. Already a few degrees of deviation from the ideal location are enough to clearly alter the colors. This can unfortunately lead to limitations particularly during mobile use. In this case we experienced a frequently required adjusting of the opening angle in order to acquire a correct presentation on the display. The 'Z' in the product description has been an indication for especially good performance reserves for Sony devices for a long time. 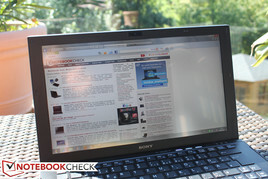 In the case of the reviewed Vaio Z21, Sony has opted for the dual-core model CPUs from the Intel Sandy Bridge palette. What is interesting is the fact that - in contrast to the initial expectations for the adoption of ULV processors - the standard 35W TDP processors have been used. Sony is currently listing three different models in the online configuration options: i5-2410M as the entry level model, i5-2524M with an already extended VT-x and VT-d functionality, and finally the i7-2620M CPU; in other words the currently fastest available dual-core processor with a base clock speed of 2.7 GHz and a Turbo bandwidth up to 3.4 GHz, as long as only one core is utilized and adequate cooling is provided. In light of the base unit height of only about 12 millimeters, this could be more complicated than thought though. More on this later. 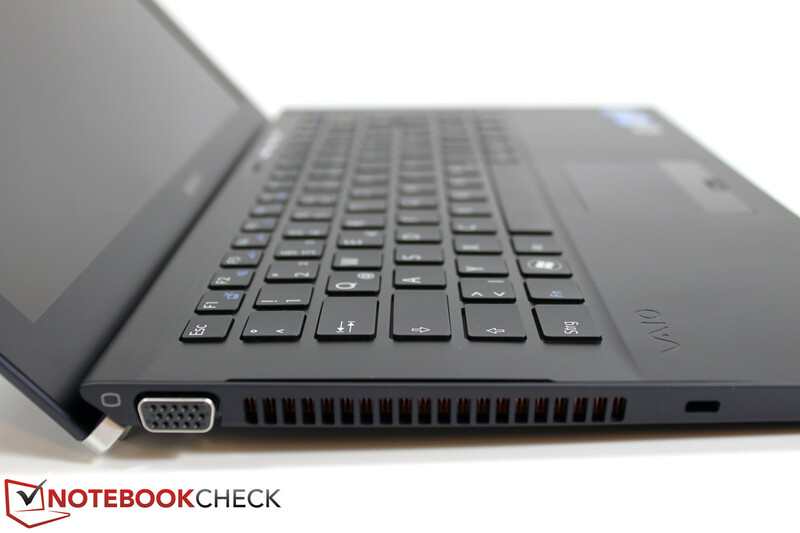 Integrated into the notebook, or more accurately: Directly in the CPU unit, there is also Intel's HD Graphics 3000 graphics solution, which is intended for office use and can therefore perform less demanding tasks with less power consumption. When it comes to particular professional tasks the Intel solution does significantly lag behind compared to other independent graphics solutions though. For this reason Sony has equipped the Power Media Dock with an AMD HD 6650M graphics chip with 1 GB of dedicated DDR3 graphics memory. In order to dock the notebook graphics intensive applications have to be closed, and the picture is interrupted very briefly. Following this, after a few seconds, the system is once again ready for use though. The Radeon HD 6650M is a mid-range graphics card from the current AMD 6xxxM family. The chip is DirectX 11 compatible, can decode HD material with its UVD3 decoder, supports the output of 7.1 surround sound via HDMI, and can theoretically drive 5 monitors simultaneously thanks to AMD Eyefinity. Apart from graphics concerns, there are therefore also plenty of reasons that are supposed to make the use of this GPU appealing. When it comes to the RAM there is the option of either 4 or 8 GB of memory of the DDR3 1333 MHz variety, which is however soldered onto the motherboard, and can thus not be upgraded. 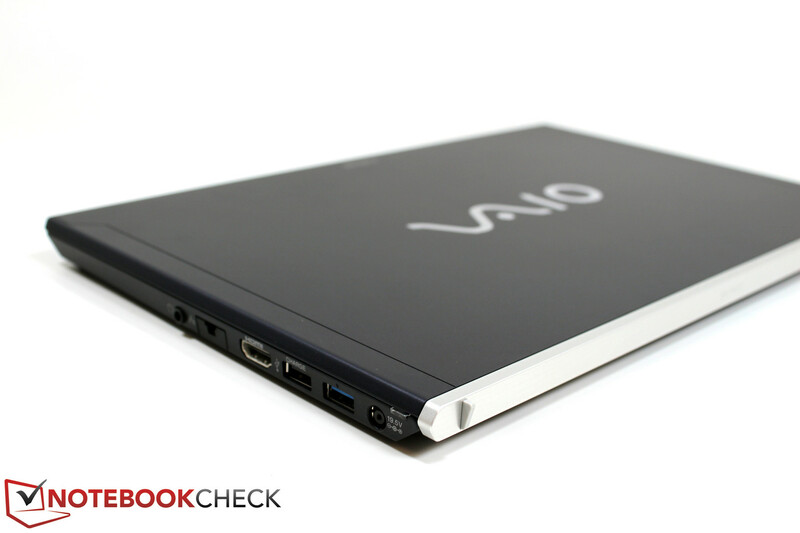 The right choices should also be made when selecting the main storage memory, which is inevitably in the form of a Solid State Drive (SSD) in the case of the Vaio Z21. The options are either flash SSD with a capacity of 128-512 GB, or SSDs in the online configuration of the 'third generation', which should have some additional performance. Or reviewed device contained the standard 128 GB entry level solution. Let's start with the analysis of the included CPU. During the Cinebench R10 Single CPU Rendering test we observed a clock speed of 3.2 GHz with short peaks of 3.4 GHz, which became less and less frequent as the test progressed. The result of 5444 points is among the best compared to other devices with the same CPU. During the Multi CPU Rendering test from Cinebench R10, the chip clock speed remained constant at 3.2 GHz. 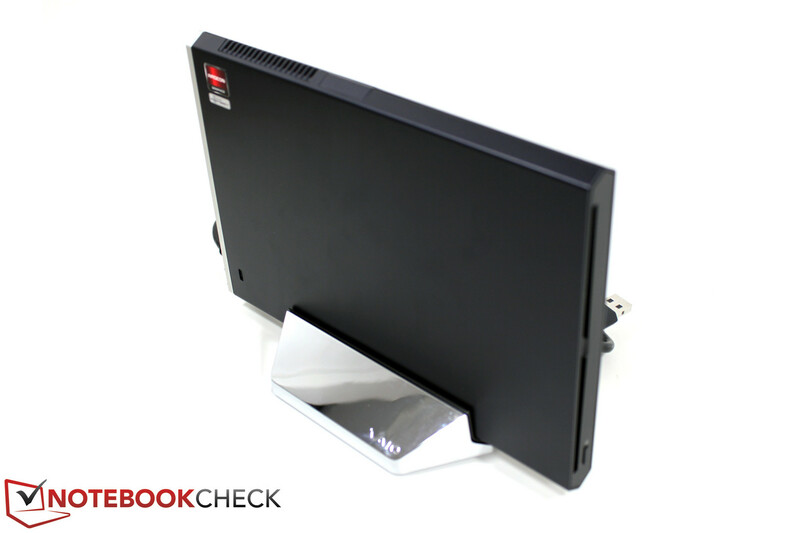 The cooling fan operates audibly louder, but the processor temperature doesn't exceed 80°C according to HWMonitor. Result: 11444 points. 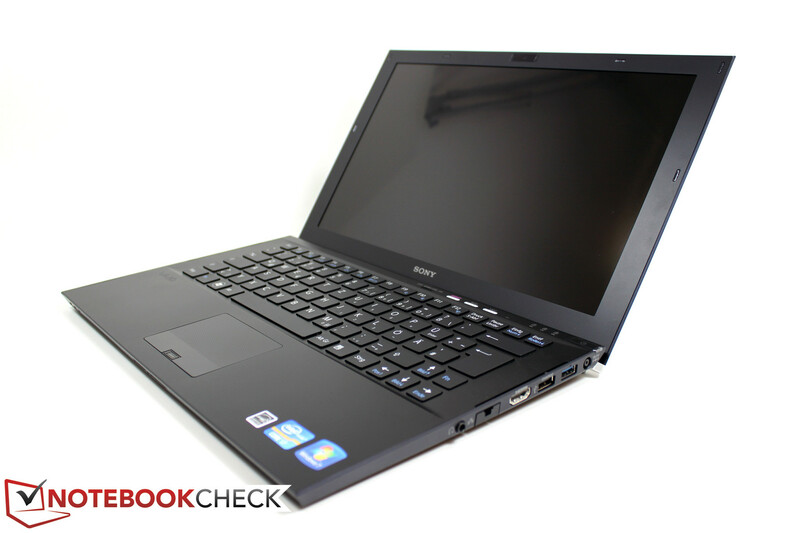 This also makes the Sony Vaio Z21 one of the fastest i7-2620M systems, which we have reviewed so far. The surprise came during the OpenGL test from Cinebench. 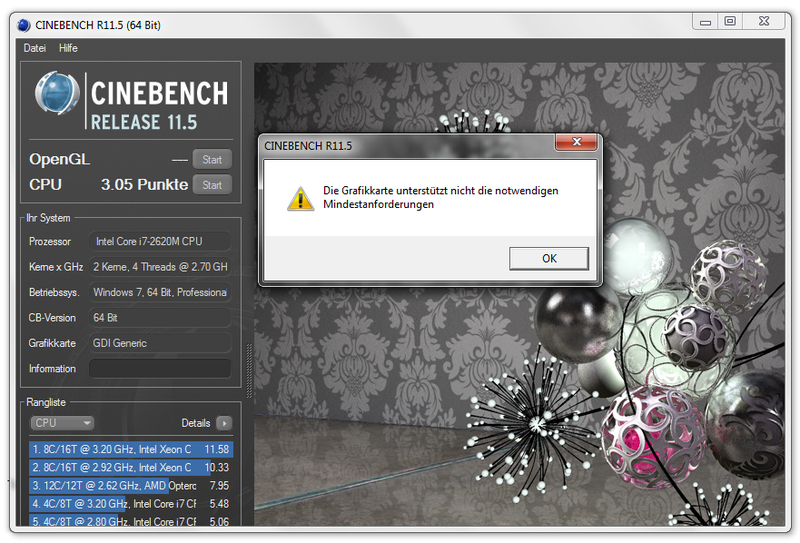 After the first judders of the benchmark, Cinebench crashed. We started again using the 64-bit mode, and reached an unusually weak 300 points following a painfully juddering benchmark. A typical result would be between 5000 and 6000 points. Why? We continued with the tests. 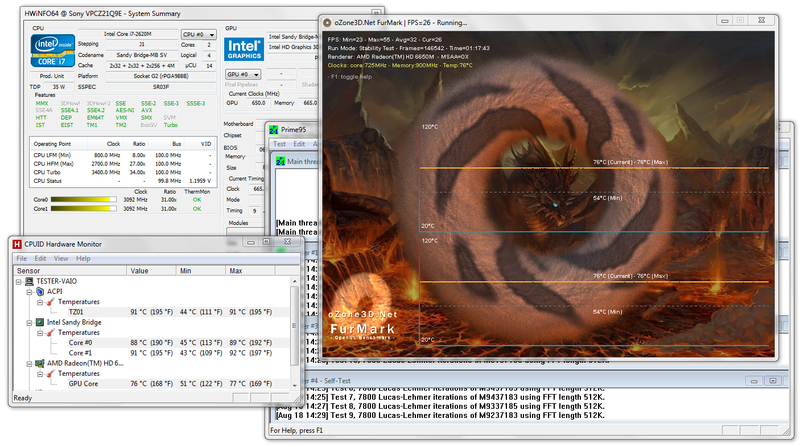 During the Cinebench R11.5 CPU test a similar picture emerges in terms of the clock speed and the temperature. The chip stays constant at 3.2 GHz and 80°C. The cooling fan, or fans, operate at full capacity though. The 3.05 points scored also put the 2620M CPU in the targeted area in this case. Following this came the OpenGL test with the surprising error message: 'The graphics card doesn't fulfill the necessary minimum requirements'. Is this possible? 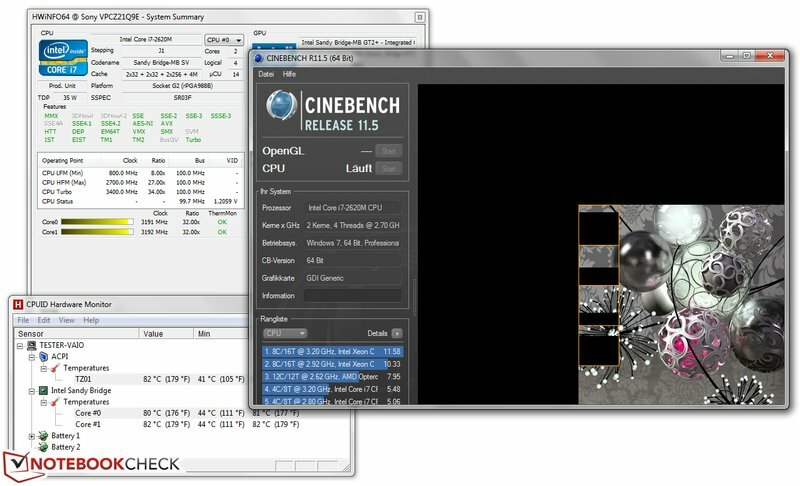 Cinebench requires OpenGL 2.0 as a minimum requirement. The analysis with Everest confirms: The adopted Intel HD Graphics 3000 merely supports OpenGL version 1.1.0 - up to date in 1997! 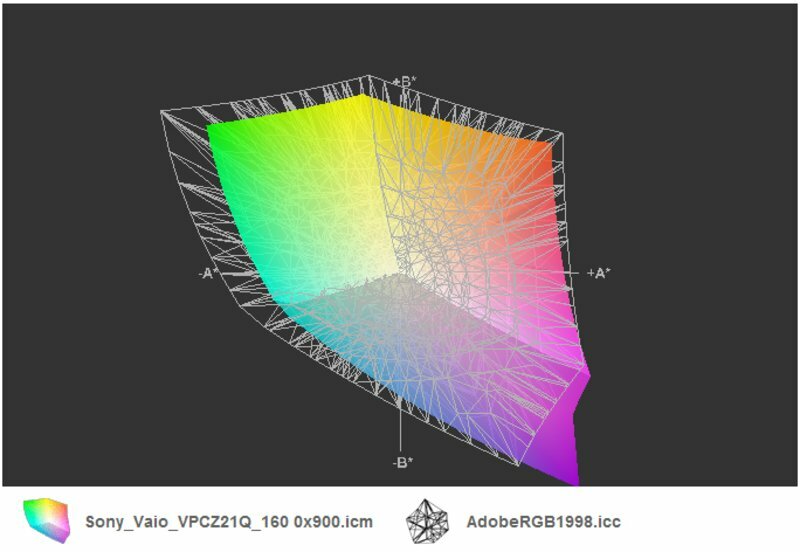 The HD Graphics 3000 should be able to support version 3.0 by definition. A1 performance in the CPU test. Surprise: OpenGL test is declined. Reason: Merely OpenGL 1.1.0 is supported. 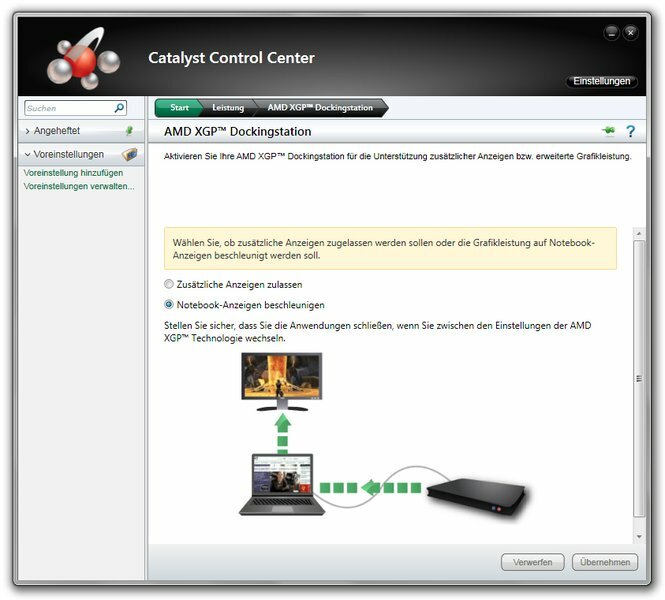 The reason for this was found following a more detailed investigation: The external graphics solution in the form of a Sony Power Media Dock is controlled via AMD XGP technology, thus the same technology which was for instance already used in the FSC Amilo Sa3650 with the description 'Graphics Booster'. 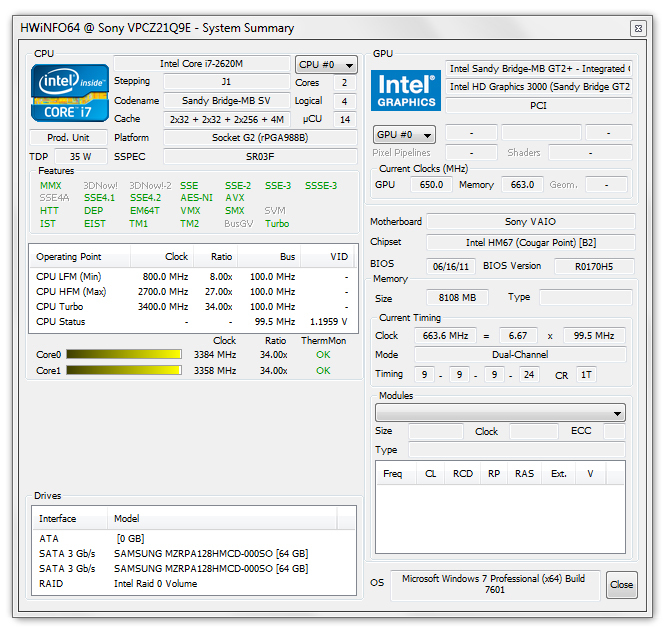 A special driver is required for this, which includes the Intel and AMD components. This appears to contain a very old Intel driver however, which only supports OpenGL 1.1. But since special drivers are required for XGP functionality, Sony's hands appear to be bound in this case, and the ball is in AMDs court to update the driver. More up-to-date drivers than those included when delivered, weren't available at the time of the review. What does this mean in practice though? Every application that requires an OpenGL version higher than 1.1.0 for the presentation of animations will likely fail in any case. This can affect diverse specialist software, as well as trivial games. Help is merely provided by the Power Dock: The AMD HD 6650M contained within it doesn't have any problems, but doesn't work in a battery powered state, and will hardly be practical for mobile use. 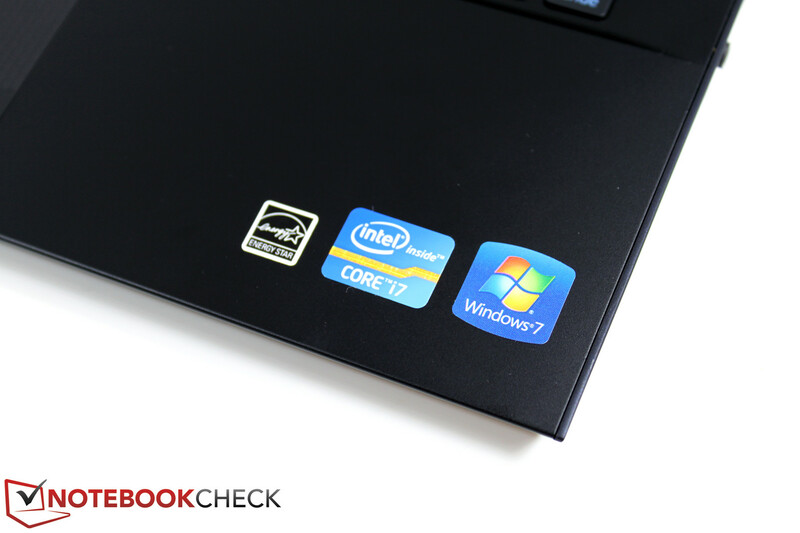 What is impressive on the other hand are the PCMark Vantage (64-bit) results with the GPU dock attached: 11107 points, which provides for a place among the best of all the notebooks reviewed by us. 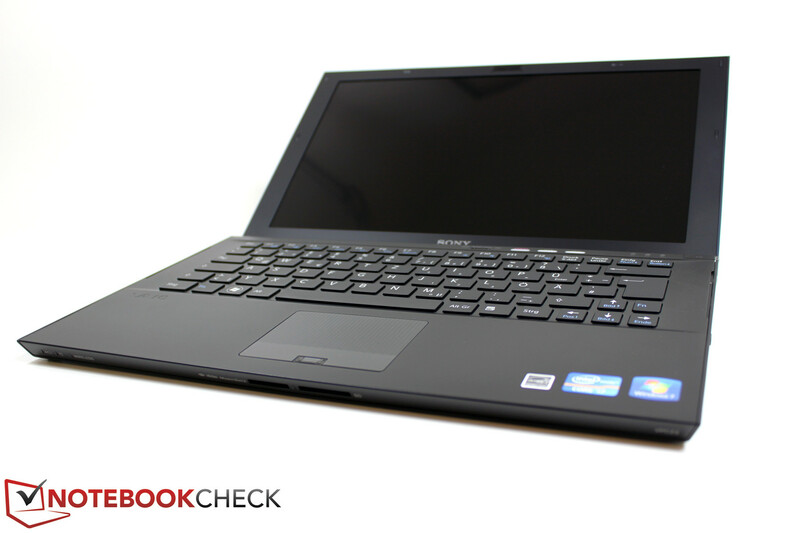 The Acer Ethos 8951G with a 2630QM quad-core CPU and GT555M graphics is on a similar level. 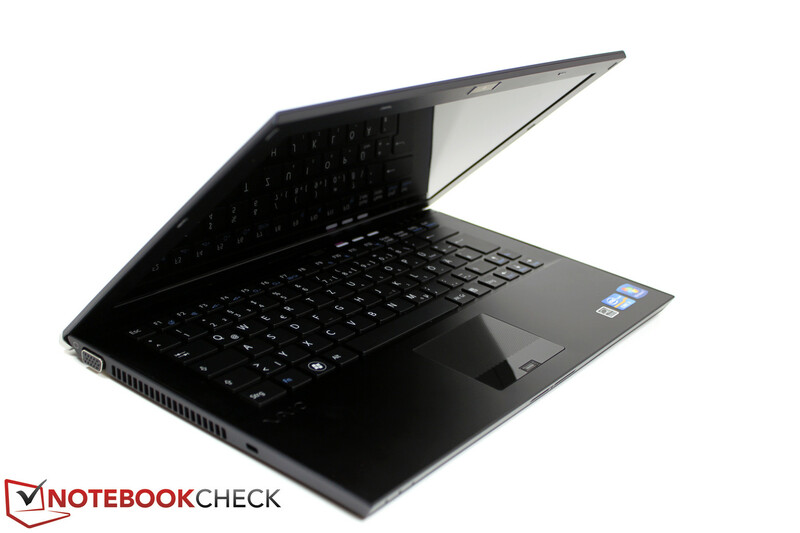 Also the Alienwares M14x with the same configuration as Acer's Ethos scores about 14302 points. Far from this are laptops with a conventional hard drive: Such as the Sony Vaio SB2 (2310M/HD 6470M) with 4857 points, and the Sony Vaio Z13B (460M/GT330M) with 5855 points. 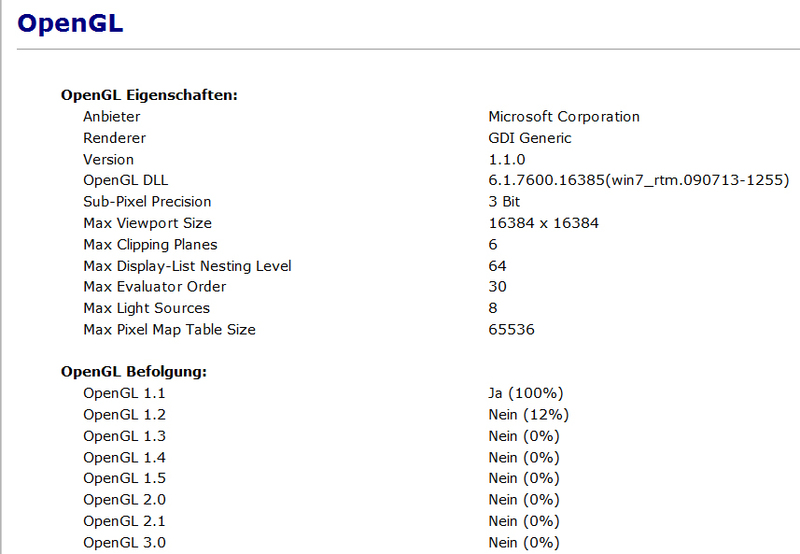 Another surprise came as a result of a repeated test without the external graphics solution: 12612 points. Better despite less graphics performance? 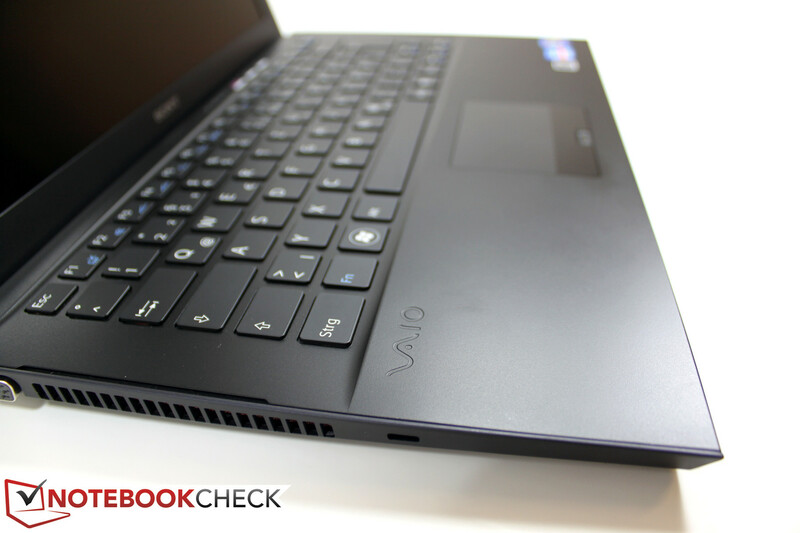 In detail the Vaio Z21 lags behind noticeably in the Memory score, as well as the Gaming score, with the integrated GPU. In all other sub-scores the notebook can catch up though, merely the HDD score remains, even if a little lower, more or less on the same level. 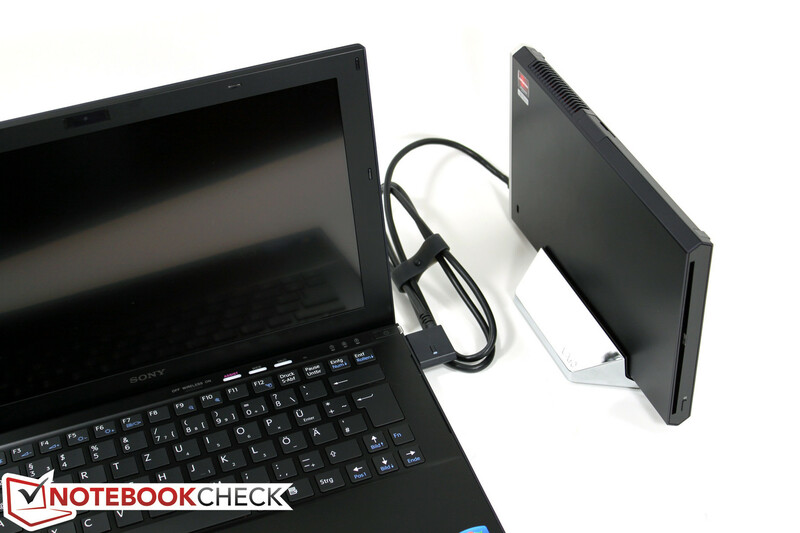 In PCMark 7 the result with the Power Dock attached is no less impressive: With 3246 points in the overall score, the notebook keeps up with the level of Toshiba's current gaming powerhouse Qosmio X770 (2630QM/GTX560M). 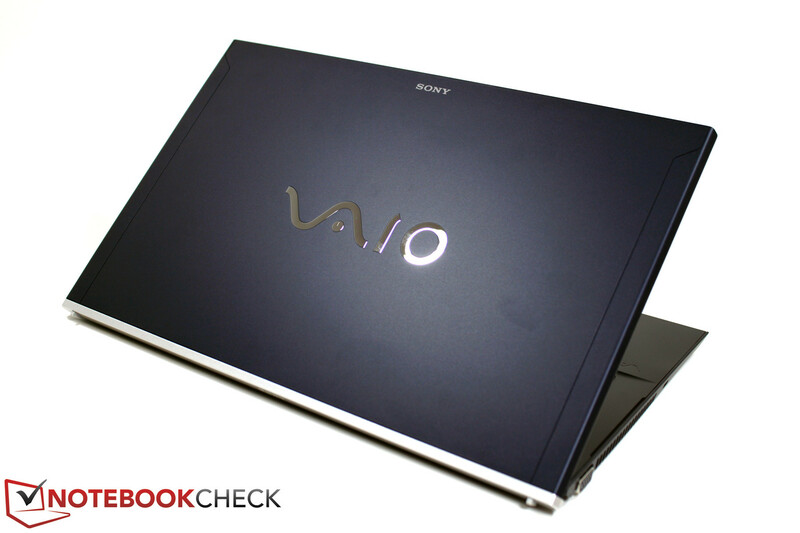 Ahead of this is for example the new MacBook Air 13 from 2011 (3561), and also the 13 inch multi talented Sony Vaio SA2Z with 3448 points (2620M/HD 6630M). In this case we also performed the test without the Power Dock attached: 3978 points, thus once again a significant improvement of the result. What improved most significantly were the Productivity score, and the Computation score. Despite the actually higher performance configuration, the result has once again not improved, but has fallen behind a little. Further concerns relating to the applied drivers make themselves apparent. The Windows Performance Index clearly recognizes the graphics solutions as a weak point (6.3 points) without the GPU dock attached. Interesting: Also during use with the Power Media Bay, the main area of concern is the GPU, and the score remains at 6.3 points. The highest score is bestowed upon the hard drive: 7.8 points. 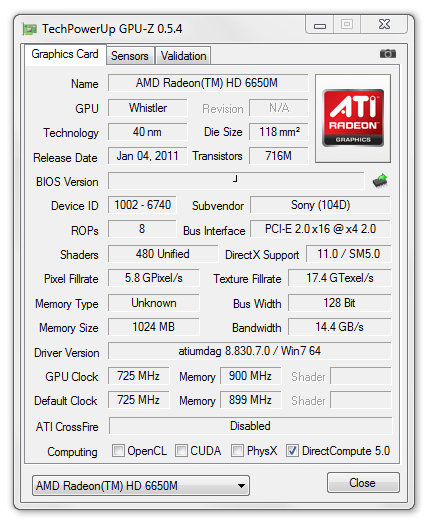 The AMD HD 6650M graphics card in the Power Dock is not unfamiliar. 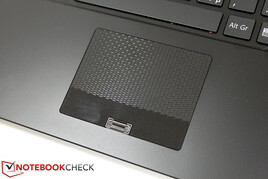 Introduced at the beginning of 2011, the chip can still be found in a number of diverse mid-range multimedia notebooks. The successor of the popular ATI Mobility Radeon HD 5650 with its 480 steam processors can essentially still process current games with medium to high details smoothly. We initially tested the chip included in the Power Dock with the familiar 3DMark benchmarks. 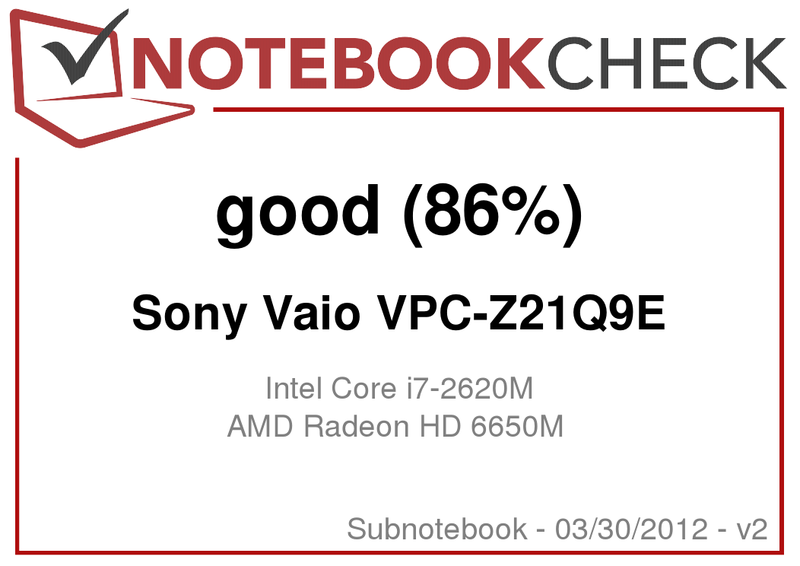 During the 3DMark 2006 (1280x1024) benchmark the Vaio VPC-Z21 managed to score 7877 points, which keeps it significantly ahead of comparably equipped notebooks, such as the Packard Bell LS11 (2410M/HD6650M) which scores 7250 points. Several devices with a similar performance can be found with Nvidia's counterpart, the Geforce GT 540M. The Z21 also manages to position itself well in the current 3DMark Vantage test. With 4087 points it still remains ahead of the Packard Bell LS11, as well as the Acer Aspire 7551G with the AMD N970 CPU. 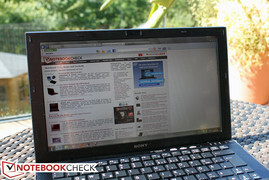 Notebooks with GT 540M graphics are able to creep slightly ahead of the Sony VPC-Z21 in this case. During the newest 3DMark 11 benchmark the tide finally turns, and the Radeon HD 6650M graphics solution is able to push ahead of the Geforce GT 540M models. At this point even the performance of the Nvidia GT 555M is reached. 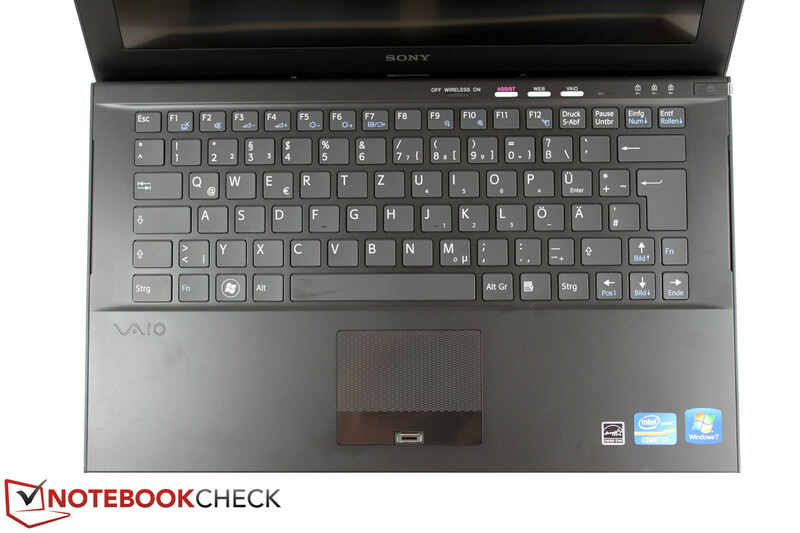 Other notebooks with the identical HD 6650M graphics in some instances also lag significantly behind the Sony Vaio VPC-Z21 in this case. In light of the miserable OpenGL performance in the Cinebench tests, we also tried the 3DMark 2006 with the integrated HD Graphics 3000. With 4506 points the HD Graphics 3000 also positions itself in the expected area in this test. All the previous benchmark tests have consistently cast the attention on one component: The included main storage memory. 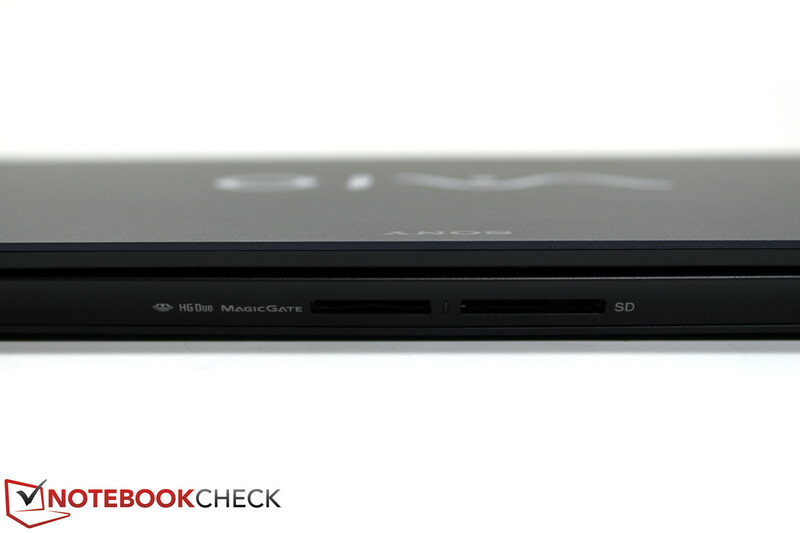 Sony has opted for an SSD solution for the Vaio VPC-Z21, the same way as with its other top of the range notebooks. In detail our reviewed device has been equipped with two 64 GB SSDs (Samsung MZRPA128HMCD-000SO) in a RAID 0 array by Sony, which amount to a total data capacity of 128 GB. With RAID 0 both of the SSDs are used in parallel, which allows for the performance to be significantly improved compared to a single SSD solution. 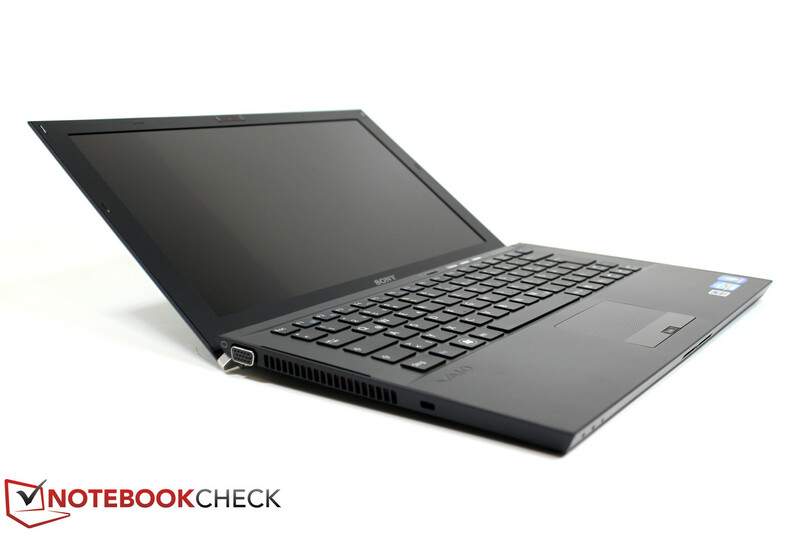 This principle already provided for top marks with the quad-SSDs in the Vaio VPC-Z13. 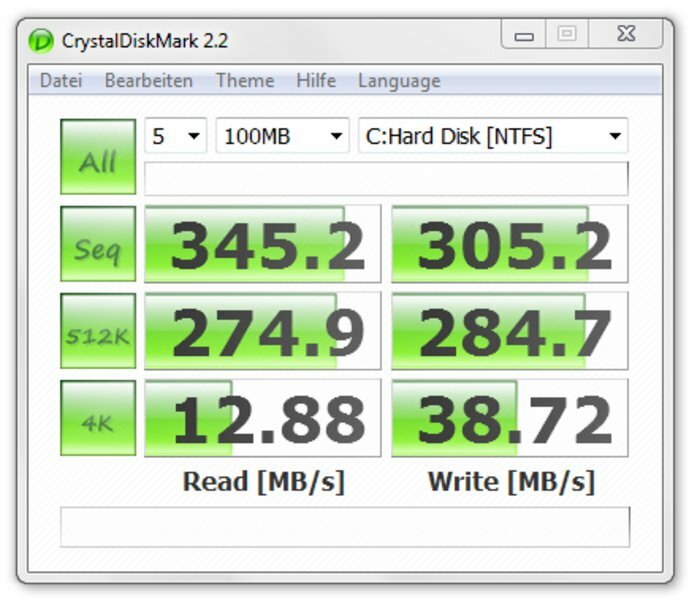 Also our SSD benchmark tests are passed with impressive results by the RAID solution. 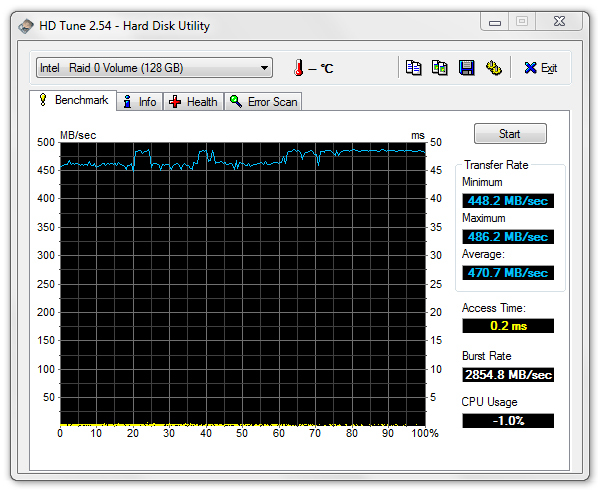 ASSSD attests that the RAID solution has excellent sequential read and write rates of 449 and 321 MB/s, respectively. A dip in the transfer rates occurs in the 4k test, which results in 12 and 30 MB/s, respectively. Nevertheless the configuration performance still contends with the current fastest solutions from Intel (Series 510 Elmcrest), and OCZ (Vertex 3). The exceptionally fast system not only stands out as a result of the good benchmark results, but also during daily use, such as with a boot time of only about 10 seconds and especially fast program start times, does the speed advantage of the Solid State Drives become apparent. 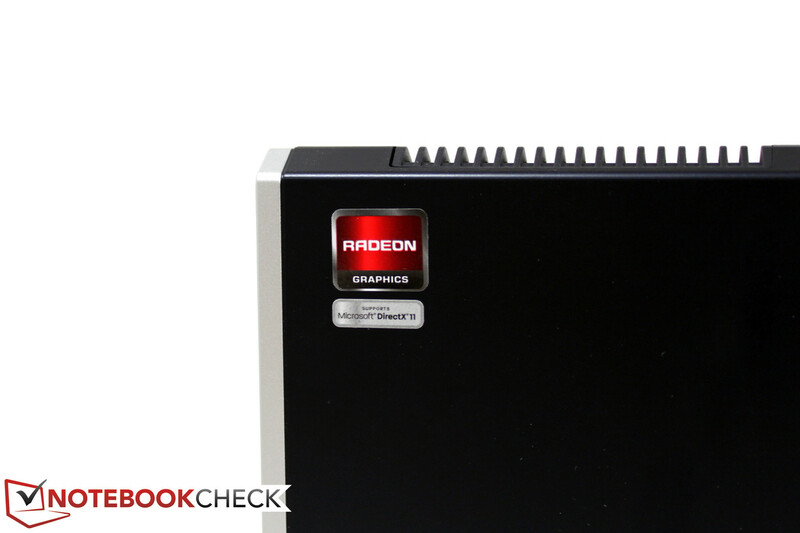 With the AMD Radeon HD 6650M there is a mid-range graphics chip in the Power Media Dock, which should definitely be capable of processing current games with appealing graphics details. We tested the performance with the aid of several games. In the process the integrated display is utilized with various resolution and detail levels together with the Power Media Dock. Already the first test with the racing game Dirt 2 reveals some mysteries. With 20.7 fps using high settings (1360x768, 2xAA, high presets) the HD 6650 only provides the performance of a GT 520M. Devices with the same graphics solution manage to achieve 30 fps in this case. We started again without the Dock GPU, in other words using the integrated HD Graphics 3000. Result: FRAPS on average gives 17.1 fps. Hardly an advantage as a result of the external GPU? We carried on testing: With Mafia 2 the next graphics challenge is on the agenda. With 33.9 fps to 16.0 fps using high graphics details (1366x768, 16xAF, high) the HD 6650M clearly has an advantage, and is more or less on the expected performance level. The Packard Bells LS11 with the same graphics for example achieves 34.2 fps. Following this comes CoD Black Ops. With 26.6 fps using high details, the HD 6650 remains behind its capabilities. The same graphics card in the Packard Bell LS11 achieves a proud 46.9 fps. We tested the BFBC2 again, this time however with an external display attached to the Power Dock. With 36.7 fps using medium details, no ground is made up in this case either. The same picture shows itself with Dirt 3. With 22 fps using high details, the Z21 HD 6650M contests with the same performance as the HD Graphics 3000, regardless of whether the internal display or an external display via the Power Dock is used. The Catalyst Control Center provides the options 'allow additional displays' and 'accelerate notebook displays' with regard to the XGP station. Regardless of which option is selected: Our gaming benchmarks just don't want to reach the expected results. Verdict: The gaming benchmarks partially achieve the expected performance level, but also partially remain significantly below the expected performance level. Whether the internal or an external display is opted for remains irrelevant. Altogether the impression of a not completely matured graphics driver arises, which prevents the utilization of a lot of potential performance. 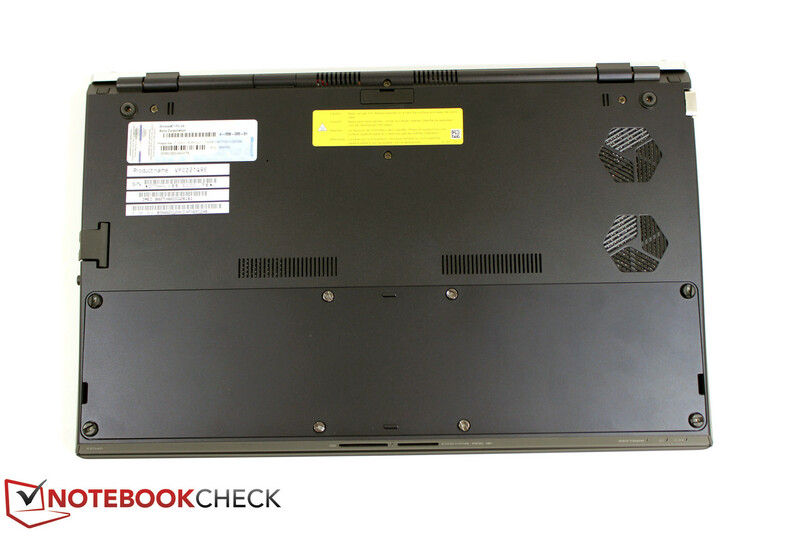 The system noise of the notebook is provided by a whole two integrated cooling fans, since the adopted SSD is known to be silent. With the help of this dual-fan design, Sony has provided the requirements to enable the integration of the powerful 35W TDP processors into the merely 12 millimeter thick case (base unit). The air vent for drawing in air is located towards the back on the left side. The fresh air is supposed to find its way to the inside via the bottom of the notebook on the one hand, and also via the keyboard the same way as with an Apple on the other. The display hinges play a special role in this context, since opening the lid pushes the display downwards, and lifts the base unit up about one centimeter at the back with the aid of special rubber feet, and thus provides for better air circulation - on even, solid surfaces of course. During use without load (idle), or when there is a little office load, our reviewed device stays very quiet predominantly without the docked GPU. From time to time there was however a short, but clearly audible, acceleration of the cooling fans. This is directly linked to short bursts of increased CPU load, to which the cooling system obviously reacts very sensitively. With the Media Dock attached during an idle state we measured 31.3 dB(A) of system noise, since the dock has its own cooling fan for the GPU. 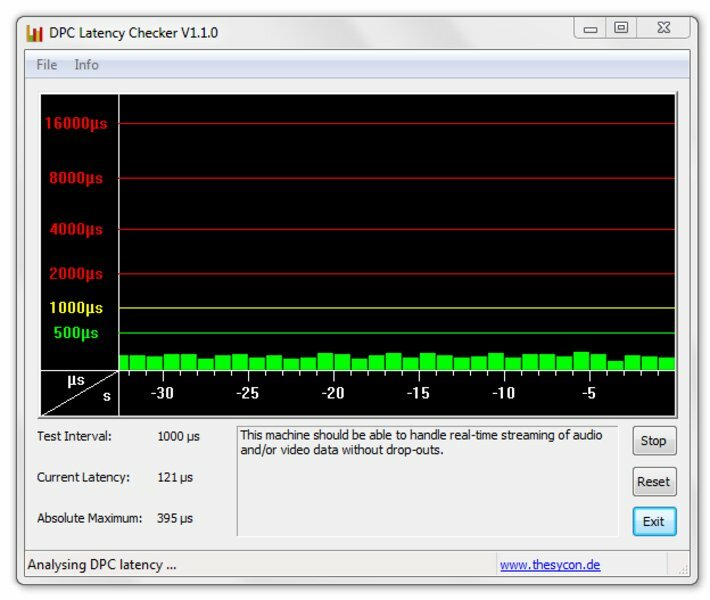 The playing back of DVDs with the dock generates a clearly audible 36.4 dB(A) of noise. Things escalate when there is a high load on the other hand. 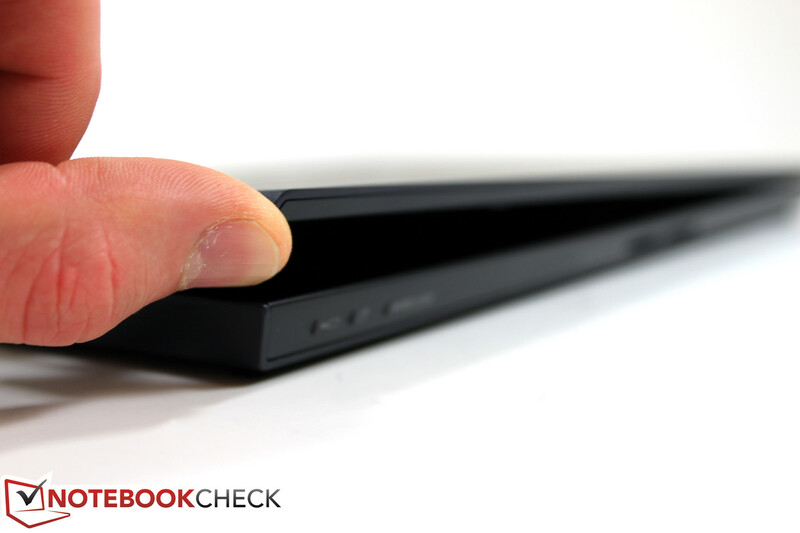 Already without the dock attached, the Vaio VPC-Z21 creates a system noise of 40.4 dB(A) during the 3DMark 2006 benchmark. 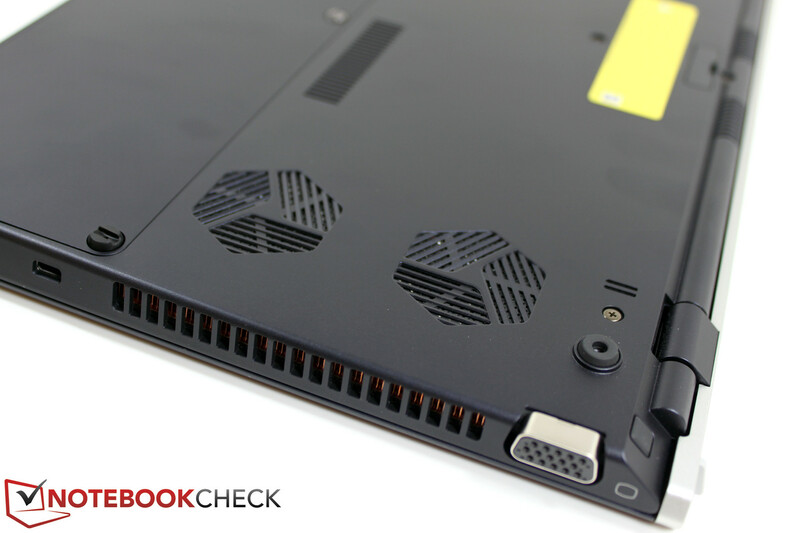 The dock in comparison to the two CPU cooling fans in the notebook stays relatively quiet. This is ultimately also valid during the stress test, as a worst-case-scenario. With a maximum measured 52.8 dB(A), the compact Sony device even makes gaming heavyweights look below par. Positive: Following a period of increased performance the system noise quickly falls back to its minimum level. During use without load, the Sony Vaio Z21 remains pleasantly temperate. The palm resting area stays at a good 27°C, and the maximum we measured on the top surface of the base unit was 31°C. The bottom only gets marginally warmer with up to 33°C. Under load (stress test for more than an hour) the surface temperatures increase significantly. The base unit reaches up to 42°C on the top surface (palm resting area 34°C), and 48°C on the bottom. We measured a maximum of 47.3°C on the Power Dock. A look at the inside attests the efficiency of the cooling system though. After more than an hour of the stress test (Prime95 & Furmark), the CPU had a clock speed of 3.1 GHz, hence the Turbo can still increase the performance. The CPU temperature stays stable all the while at about 90°C. Signs of a temperature related throttling was therefore not observed. (±) The average temperature for the upper side under maximal load is 37.9 °C / 100 F, compared to the average of 30.7 °C / 87 F for the devices in the class Subnotebook. (±) The maximum temperature on the upper side is 41.7 °C / 107 F, compared to the average of 35.8 °C / 96 F, ranging from 22 to 57 °C for the class Subnotebook. 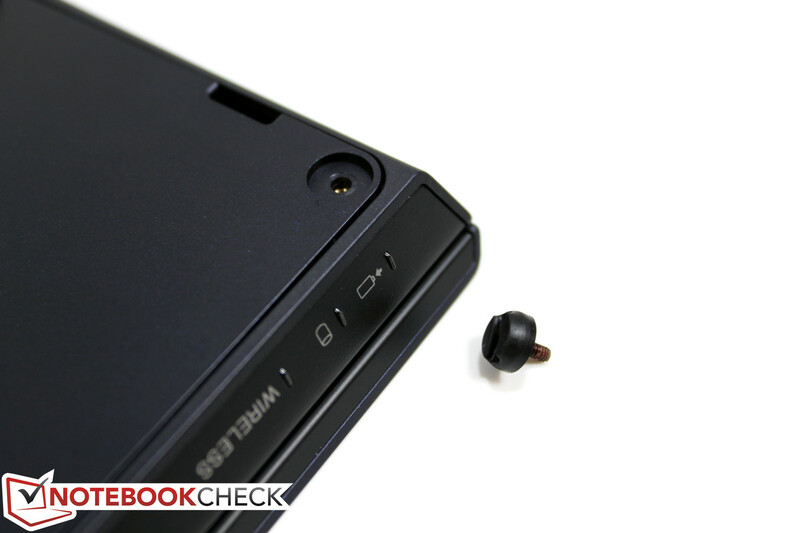 The Sony Z21 may have two stereo speakers, but their purpose is a mystery to us. The generated audio is quiet, thin, restrained, and far from a listenable minimum quality. Even the playing back of background music appears to pose an especially difficult task for the two speakers. In any case users should opt for an external audio solution. The provided headphone output provided a clean signal during our test with enough signal strength. Without the Power Dock the Sony VPC-Z21 is relatively frugal, at least as long as the required performance stays within limits. 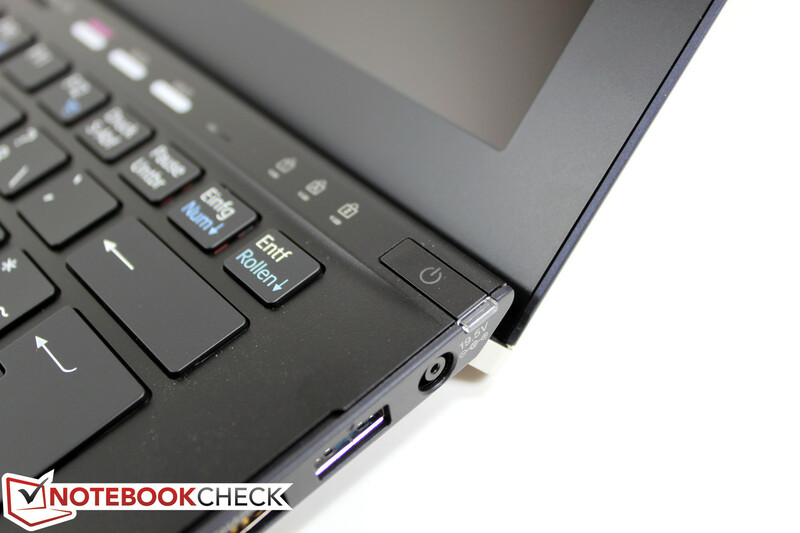 With 6.4 W - 10.9 W in an idle state, it belongs among the most modest laptops that we have tested so far, in terms of the power consumption. Under load the notebook draws between 45 W and 56 W from the plug, depending on the task. In the standby mode we measured 0.3 W.
The picture changes as soon as the Power Media Dock is connected. 19 W - 23 W during use without load, and 57 W - 96 W under load, or more specifically during the stress test, explain the significantly bigger rated AC adapter for the Power Media Dock (120 W). In light of the measured values regarding the power consumption, first indications for the likely possible battery life start to emerge. In the device itself there is an especially thin, two part Lithium-Polymer battery, with a capacity of 45 Wh. 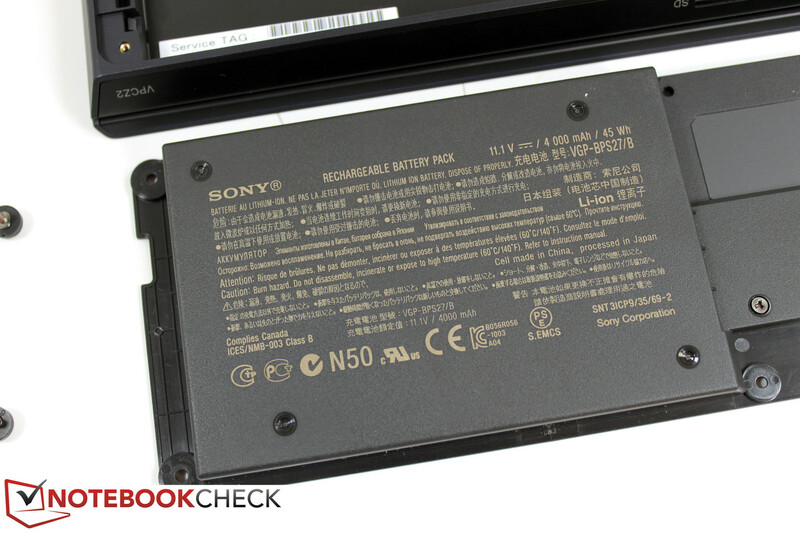 Sony also offers an optional additional battery with the slice-principle, more specifically a thin plate, which is attached to the bottom of the notebook. With a capacity of 48 Wh this should be capable of doubling the battery life measured by us. With an additional weight of around 520 grams this also increases the total weight of the laptop by about 50% though. The additional battery (VGP-BPSC27) is available from about 125 Euros from retailers. With the integrated 45 W battery we measured a maximum battery life of 546 minutes which equates to about 9 hours, with the BatteryEater Readers test (minimum display brightness, wireless modules off, power saving profile) as could be expected. Using the Classic test (load, maximum brightness, wireless modules on, maximum performance profile) things already come to an end after 70 minutes though, when the battery is empty. For practical WLAN surfing (profile balanced, wireless modules on, adjusted brightness: -1) we reached a battery life of about 6 hours while surfing a mixture of websites. The mobile use without a power connection is therefore definitely still comfortably possible, even without the additional battery. It all started so well: The technical specifications, as well as the additional features in the press releases, spell out a wishlist for the perfect notebook: Small, light, first class materials, a high quality display, ample performance, small emissions, and battery life that makes it possible to forget that electricity is even necessary for its operation. The reality is unfortunately, as so often, a little different. The devil is in the detail. The case is impressive with a timeless design and high quality feel. Not to be forgotten is the especially thin build, and a total weight of less than 1200 grams. What the carbon fiber chassis can't do though, is to provide a convincing shape rigidity. The case only comes to terms with pressure and bending to a limited extent. The provided interfaces are well placed, and considering its build the device is also able to give a satisfying assortment. 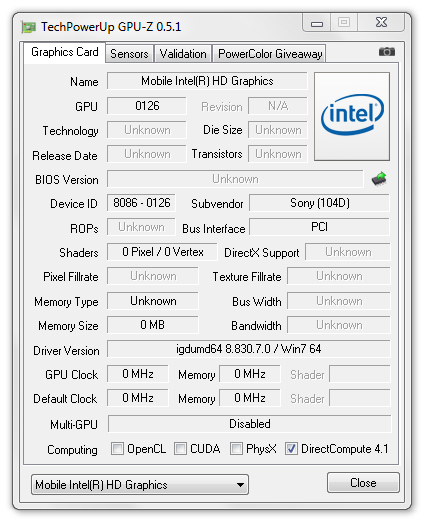 With the Power Dock solution, which uses Intel's Light Peak technology, the device is extended by a GPU as well as additional interfaces during desktop use. Integrated UMTS/HSUPA, elaborate, even if expensive accessories, and service upgrades (unfortunately no On-Location service) make the device more enticing. The keyboard takes some getting used to with regard to the typing feeling, as well as the touchpad, which we couldn't really develop a liking for. When it comes to the display, Sony does (almost) everything right: Good resolution (1600x900, FHD optional), high brightness (around 300 cd/m²), and sufficient contrast, even let the Sony VPC-Z21 look good during outdoor use. A shame: The meager viewing angle stability along the vertical plane, which is especially detrimental during mobile use. Things get interesting again when it comes to the performance. 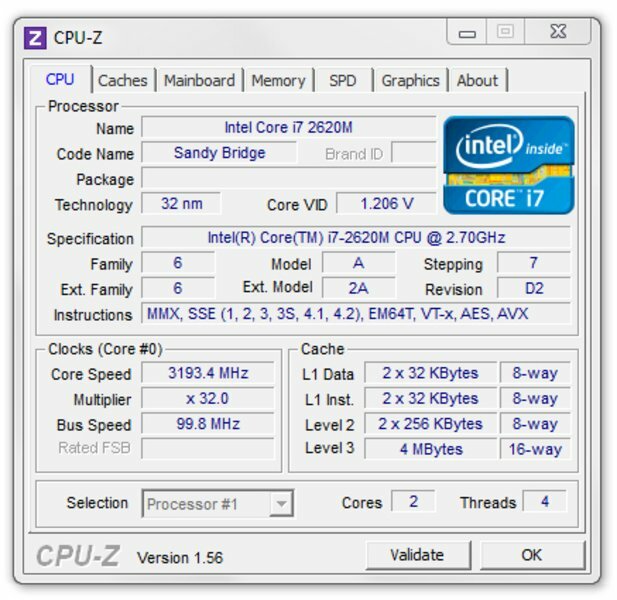 Thanks to the extremely fast SSD, and the Intel i7 Sandy Bridge CPU, the Z21 catapults itself to the top of the rankings in terms of application performance. The external AMD HD 6650M is able to deliver the expected good performance with some benchmarks, but unfortunately falls behind expectations significantly with some gaming tests. The old OpenGL driver for the HD Graphics 3000 could also pose a drawback in some cases, which can potentially lead to problems with some applications. In fact we generally anticipate a problem with the driver (special AMD drivers required for the XGP station), since these are already antiquated when the notebook is delivered, and there are no updates available at the time of writing this review. 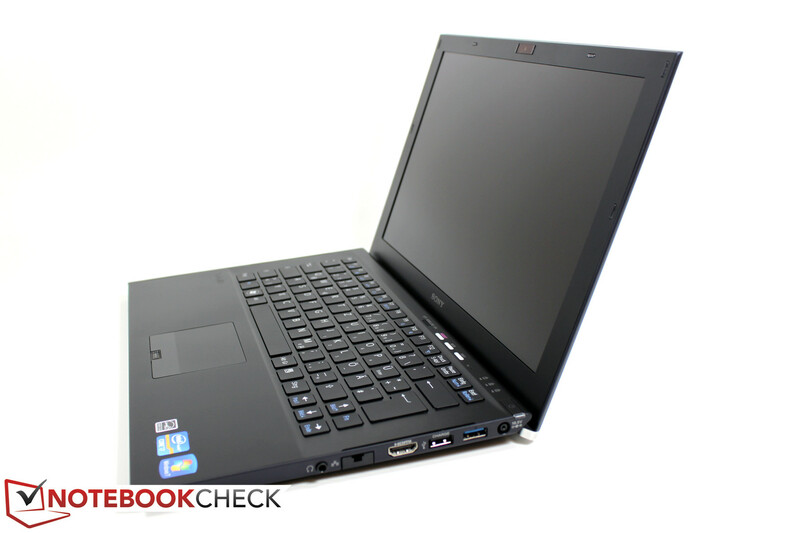 As far as the emission of the notebook are concerned, these are primarily a result of the required performance, either users can be pleased with a silent companion, or have to come to terms with a noticeably loud cooling fan and a hot case. This does stay within limits though, since the notebook quickly becomes inconspicuous again following the elevated performance requirements. Also when it comes to the battery life, a full days use without a power cable is possible, until the power socket is connected again for about an hour, after which everything is possible again. 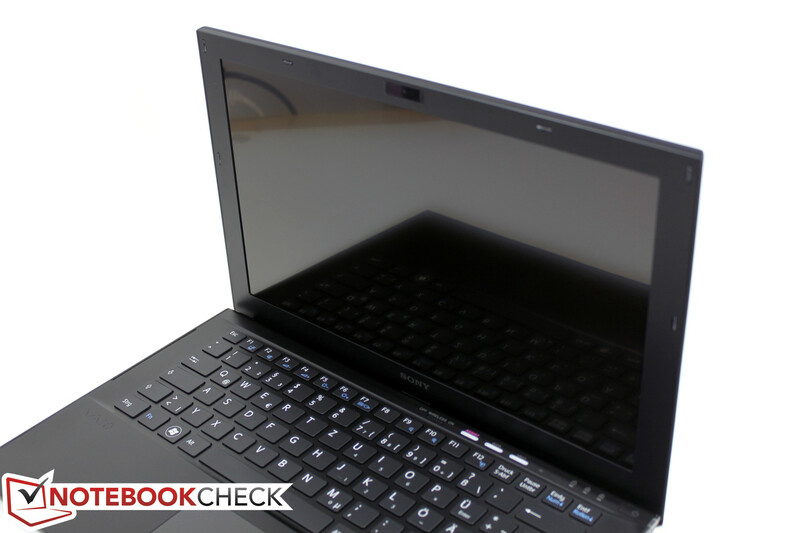 The Sony Vaio VPC-Z21 is an altogether attractive subnotebook from the upper range. Combined with the Power Media Dock an extended application may be possible, but there are also certain problems associated with this, which can probably be traced back to the applied drivers. The project 'subnotebook' can be described as a success, the project 'external graphics solution' still leaves a question mark at present though. 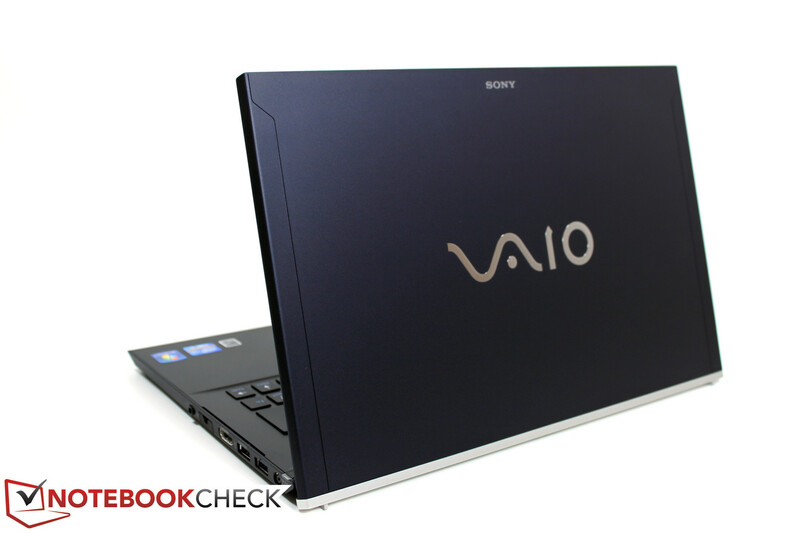 Even without the external GPU, the Sony Vaio Z21 shines with exceptional application performance. The external graphics solution promises performance, which it is unable to fully provide. The idea is good, but the missing up-to-date drivers compromise the ideal picture. 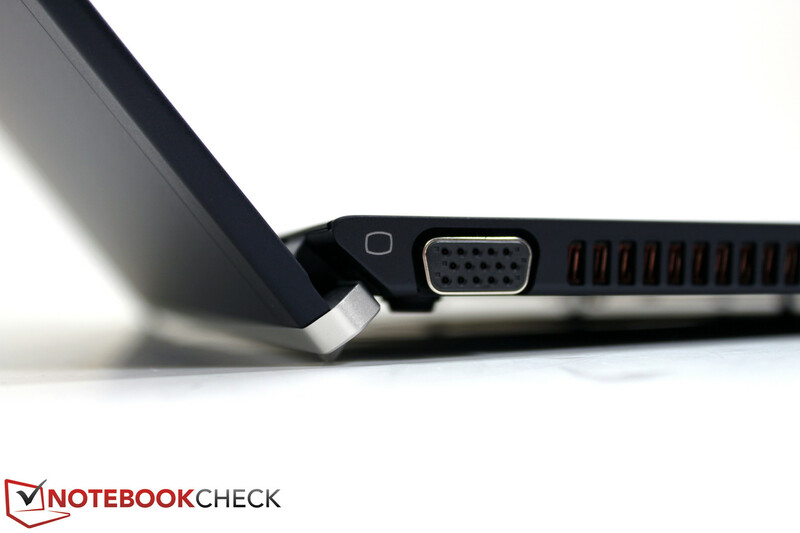 The lacking VGA signal from both of the available ports (laptop and dock) is not worthy of a high-end notebook. 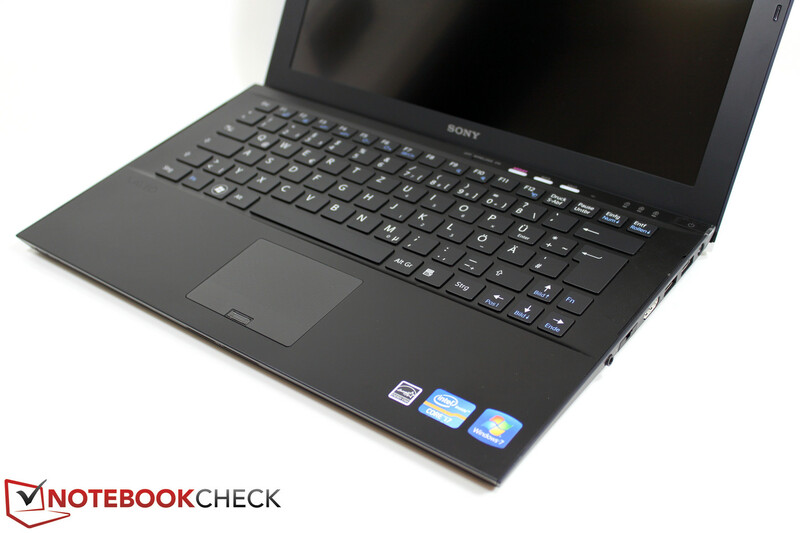 The combination of performance with a slim and ultra-mobile subnotebook from Sony won't be matched any time soon. Depending on the configuration, alternatives would for example be Apple's MacBook Air 2011, or for elevated performance requirements the MacBook Pro 13 inch. Samsung's 900X3A will in comparison only satisfy mobile users. From Sony themselves there is also the Sony VPC-SA2Z for just under 2000 Euros, which stands out with HD 6630M graphics. 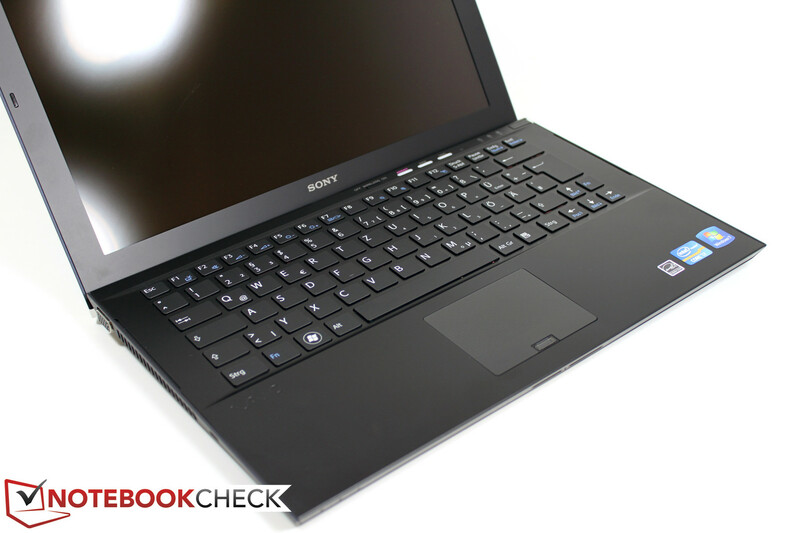 One of the highest performance 13 inch notebooks, at least when it comes to the GPU, is the Acer Aspire Timeline 3830TG with GT 540M graphics. Performance in abundance is available in the slightly bigger 14 inch format: Alienware M14x with GT 555M graphics and Intel i7-2630QM CPU, which also approaches the 3 kilogram mark though. 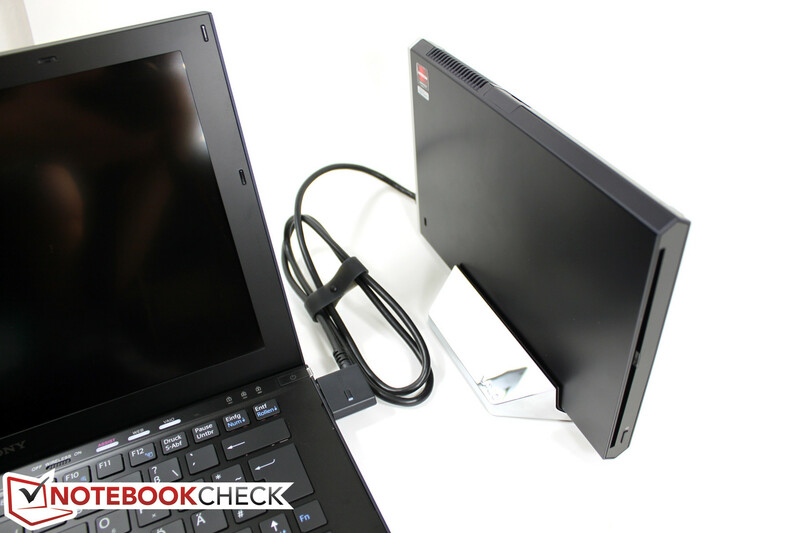 Those that want to save, should take a closer look at the Dell Vostro V131, or Lenovo's Thinkpad Edge E320. Also the Sony VPC-SB2, with a 13 inch format and HD 6470M could be worth a look for price sensitive buyers.